Crossing into Estonia: leaving Latvia after our 4 weeks travels around the country, we crossed the open Schengen-border into Estonia (Photo 1 - Estonian border) (see left). Nigula Bog in Nigula Nature Reserve: Some 23kms into Estonia along the main Route 4 Via Baltica (click on Map 1 right for details of route), we turned off at Häädemeeste onto back lanes leading in 25kms (including 8kms of dusty gravel road) to the Nigula Nature Reserve for the Nigula Bog Walk The Nigula Nature Reserve was established in 1957 to protect the area's extensive forests and wetlands. The information centre just before the Reserve provided a detailed map and commentary sheet for the board-walk circuit around the Bog Walk. From the shady parking area, a path led through to Nigula marshland-lake where the lake-shore board-walk turned off through pine and birch woods (Photo 2 - Nigula Bog Walk). Under the shade of the trees, the forest floor was a paradise garden of all the northern flora we had over the years come to know: Bilberry, Bog Bilberry, Crowberry, Lingonberry (see below left) and Cranberry (Photo 3 - Cranberry - ripening fruit) all with ripening fruits, and a prolific growth of Cloudberry leaves but little fruit; perhaps this summer's continuous drought had restricted the development of flowers and fruit. 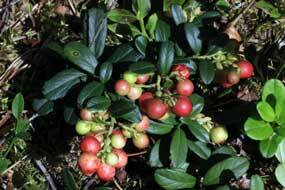 There was also much heavily scented Labrador-tea, Ling and Bog Rosemary. With sunlight filtering down through the trees, this was a botanical photographic field day. At the far end of the lake, a look-out tower gave an overview of the extensive area of raised bog with the continuing board-walk stretching across into the distance (see left). 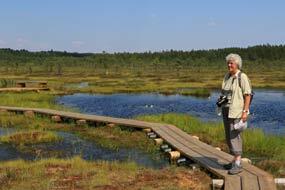 There was no time this afternoon for the complete 6.8km circuit around the bog-land, but we walked a couple of kms out on the newly upgraded board-walk across the open raised bog. With this summer's heat-wave, the marsh's sphagnum moss was crunchy-dry, but we managed to find regular tiny rosettes of round-leaved insectivorous Sundew (Drosera rotundifolia) (Photo 4 - Sundew), a few specimens of long-leafed Great Sundew (Drosera longifolia), and some Bog Rosemary in flower. 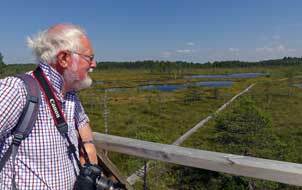 Reaching another look-out tower, here by an area of bog pools the Sundew flourished in the wetter marshy ground. 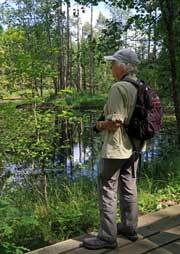 Having taken photos looking out over the mire, we retraced our route back along the board-walk and through the forest to the parking area. 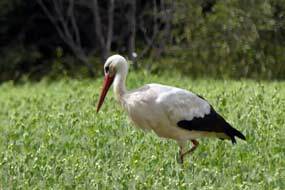 Back along the gravel road, we passed a number of storks' nests now so crowded with almost fully grown young that the adult birds were having to squat on nearby posts alongside the nests. Riisa Rantso Camping in Soomaa National Park: back to the Via Baltica, we continued north towards Pärnu (click here for detailed map of route). Traffic was now busy, and the contrast in driving standards between the more law-abiding Estonians who generally respected the 90kph speed limit, and the aggressively reckless overtaking by Lithuanian and Latvian drivers was marked. Thankful to leave Route 4, we turned off in the outskirts of Pärnu onto Route 59 to Tori and Jöesuu, following the brown signs for Soomaa National Park. Beyond Jöesuu, 8kms of gravel road led us past the parking area for tomorrow's Riisa Bog Walk, and finally to Riisa Rantso guest-house; an earlier phone call had confirmed we could camp there tonight. 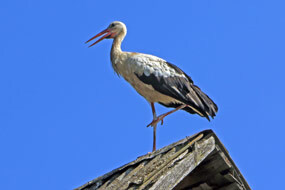 There was no one about to agree where we could camp or find power, and we eventually pitched in the orchard with a perfect view of the storks' nest with growing young on a nearby pole-platform. The owner arrived and found us a power supply in the garden store. 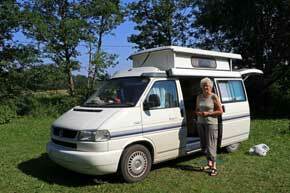 It was a lovely setting to camp, and exhausted after a long day, we relaxed with beers in the hot evening sunshine. 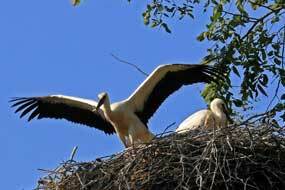 After a steamy night with bothersome flies, we breakfasted in sunshine at a picnic table, watching the two growing young storks on the nest in the orchard flexing their wings and learning to fly (see left); they only have 5 weeks now to perfect their newly acquired flying skills before they will have to face the challenge of their migratory long-haul flight to Southern Africa for the winter. The adult birds returned regularly to the nest with bill-clattering announcement of feeding time, and regurgitated stomach contents from their foraging trips in the nearby fields and marshes for the young birds to peck at (Photo 5 - Young storks' feeding time). Riisa Bog Walk in Soomaa National Park: Soomaa National Park (see right) was set up in 1994 to protect the large area of grass meadows, bog-lands and forest and its resident wildlife. The low-lying wetlands are susceptible to regular flooding during the springtime thaw with large amounts of melt waters running down from the neighbouring uplands; the sluggish rivers of Soomaa cannot contain the water which spills out across the flood plain grasslands, bogs and forests making the dirt road which crosses the area impassable especially around Riisa where the 3 rivers, the Lemmijõgi, Halliste and Raudna meet. This springtime tendency to flooding in Soomaa is called the Fifth Season. In such boggy wetland environment, the traditional means of transport was the Laabja dugout canoe, hollowed out of a single aspen trunk and propelled standing with a large paddle. The parking area for the Riisa Bog Walk a couple of kms back along the lane from Riisa Rantso had no shade meaning we should have to leave our camper in full sun all day. 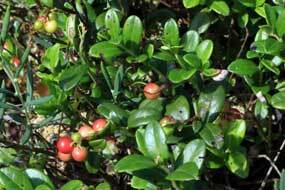 The 6kms board-walk circuit around the raised marshland passed initially through an area of lightly wooded mire, rich in all the regular wetlands flora: Crowberry, Cranberry, Lingonberry, Cloudberry (Photo 6 - Cloudberry ripening fruit) (see left), Labrador-tea, Bog Rosemary, and Leatherleaf, all growing under the shade of the stunted pines and birches. There was little manoeuvring room on the narrow board-walk for close-up photography of the flora, particularly the insectivorous Sundew which grew in tiny rosettes in the now dry sphagnum. We had with us copies of the National Park Riisa maps from our 2011 visit, but in the intervening time the board-walk had been renovated and widened, and an alternative loop created through the dark and barren pine forest by the river. 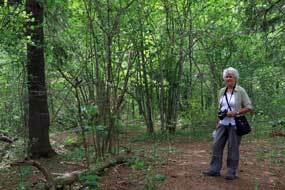 We however continued ahead along the original board-walk across more partially forested bogland, looping out into more open raised mire to an area of marsh-pools and back along the edge of the forest which skirted the Naesti jõgi (river). The board-walk now cut out across the open raised bog passing more pools (see right), and here on the wetter sphagnum we found more Sundew including specimens of the long-leaved Great Sundew (Photo 7 - Great Sundew). Despite absence of shade, a fresh breeze blew across the open mire keeping temperatures tolerable. Beyond an area of larger bog-pools the route looped back across the mire to reach the look-out tower which gave a panoramic view over the endless bog-scape with the board-walk cutting a straight line across it. Beyond here there were more stunted trees but less flora to detain us, and we walked more quickly to complete the circuit back to the parking area. 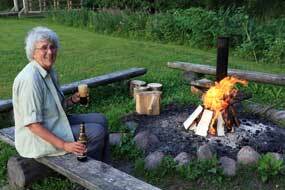 A camp-fire at the excellent Soomaa National Park Visitor Centre: 12kms south along the gravel road, we reached Tõramaa and Soomaa National Park Visitor Centre where we had enjoyed a memorable camp and camp-fire in 2011 on Sheila's 65th birthday. At the Centre we were again greeted with unparalleled hospitality and quality information: yes we could camp without charge in the open field, where there was now power supply, drinking water taps, earth-privvies, and a camp-fire circle with chopped wood. One caravan was here already, but we tucked George into shade alongside the common-room shelter and settled in, even able to borrow an extension lead from the Centre to reach the power supply. The Wilson family from California with 3 their year old daughter was staying in the hut and we chatted with them exchanging email addresses. It was a truly peaceful setting, and after our barbecue supper (see right), despite being a warm evening, we lit another celebratory camp-fire to sit round as dusk gathered (Photo 8 - Soomaa camp-fire) (see left). Soomaa National Park Beaver Trail: our camping spot remained in the shade of the forest trees the following morning and we breakfasted outside in cooler air. The American family departed bidding us farewell as we prepared to walk the nearby Soomaa National Park 2km long circuit Beaver Trail through the forest bordering onto the camping area. The path wound initially through spruce forest and was lined with purple and yellow Wood Cow-Wheat. The woodland flora was well-labelled, but at this time of year with flowers past it was all rather amorphous. The route then progressed on board-walk through a birch grove, with labels on trees showing the record heights of spring-time floods, up to a metre above the forest floor; but today, after the summer drought, the ground was bone dry. 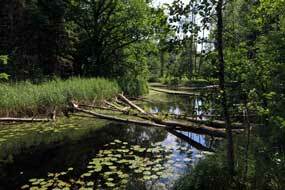 The board-walk led around to the Tõramaa jõgi where tree trunks had been gnawed and felled across the river by beavers to form dams to raise water levels for their water-protected lodges (Photo 9 - Soomaa Beaver Trail) (see left). The route followed the course of the creek (see right), and although there was no sign of beaver lodges, there was much evidence of beavers gnawing at the lower levels of tree trunks and severed tree stumps, with piles of wood chip gnawings beneath. The board-walk led around along the river and back through the forest to the camping area start point. The Soomaa National Park Visitor Centre certainly ranked high among the trip's most highly rated TICs for the staffs' helpfulness, its free campsite, and supply of quality maps and commentary sheets about walks, not only in Soomaa but other national parks in Estonia. Junsi Puhkekeskkuse (Holiday Centre) near Kõpu: we continued south along the dusty gravel road for 22kms, through Tipu passing Junsi Puhkekeskkuse (Holiday Centre) where we planned to camp tonight just off the road before the village of Kõpu. After shopping in Kõpu, we returned to Junsi, and 2kms along a dusty gravel side lane we found the place locked and deserted. A phone call brought no reply, so we tried the Kõpu Visitor Centre who offered to phone the owner on another number. 5 minutes later, the owner arrived in her car, and although speaking little English, not only opened the guest house to give us access to WC/shower and kitchen, but left us the key to hide under a stone when we left, loaned us an extension cable to reach the power supply, and charged just €10 for a night's stay. This was truly welcoming hospitality. The garden setting was delightful (see left), and we had this peaceful place to ourselves and the flies and wasps which swarmed around as we pitched in the shade of a large tree. Evening clouds began to gather, threatening an early start to the rain forecast for the coming days, but it remained hot and heavy with the rain coming to nothing. Junsi Puhkekeskkuse was a good find and served us well, with its shaded and peaceful garden setting, homely facilities, excellent value price, and most of all the owner's charming hospitality. When we departed the following morning, we left a note of thanks with the key. 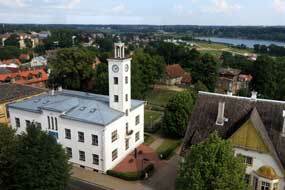 The attractive town of Viljandi: the following morning, Route 92 took us into the pleasant provincial town of Viljandi (click here for detailed map of route). All of Viljandi's public parking is free of charge, and we were able to park without difficulty in the centre by the TIC, where the helpful youngster provided street plan and walking guide around the town's sights. Having eaten our sandwiches lunch on a bench in the town park, first stop was St John's Church (Jaani Kirik) (see right) by the side of Viljandi Castle's dry moat. 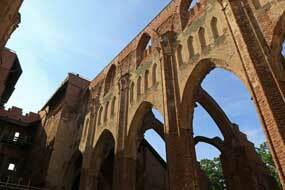 The church was founded as a Franciscan Monastery in 1466, and the monks expelled at the Reformation. 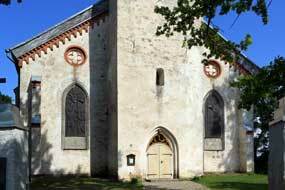 The church was damaged in the 16th century Livonian Wars and in the 18th century Great Northern Wars, and was restored when Estonia became part of the Tsarist Empire. During post-WW2 Soviet occupation, St John's was closed and used as a warehouse, and after Estonia regained independence, the church was re-consecrated on St John's Day 1992. 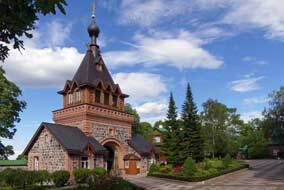 Today it serves a thriving congregation as Viljandi's parish church with its starkly impressive white interior. 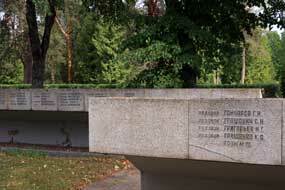 In the park opposite, the Monument to the Victims of Stalinist Repression commemorates the 1000s of Estonians from Viljandi County who were executed or deported to Siberian prison camps during the 1940~50s by the Soviet occupiers. 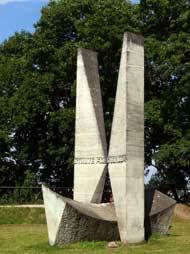 The monument was unveiled in 1991 on the 50th anniversary of the first mass deportations of Estonians in 1941. 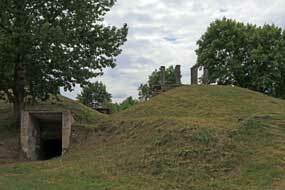 Viljandi's Song Festival Arena (see above left) filled the valley between the park and the castle mound. 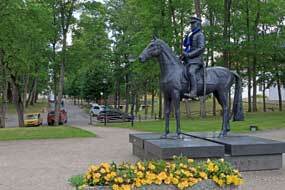 In a corner of the park by the Song Festival Arena stood the equestrian statue of General Johan Laidoner (1854~1953) (see right), the former Tsarist officer who was born in Viljandi County and led the Estonian army in the 1918 struggle for independence, becoming Estonian Army Commander under the first President Konstantin Päts. 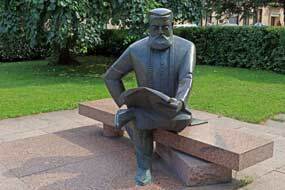 After the 1940 Soviet occupation of Estonia, Laidoner was arrested and died in a Soviet military prison. A track led from the valley up to Viljani's iconic little suspension bridge (Photo 10 - Viljandi suspension bridge) across the castle dry moat. Now a decorative feature of the castle parklands, the bridge was given to the town by a philanthropic local aristocrat in 1931. This led across to the remains of the town's monumental Castle, constructed in 1224 by the Livonian Order on the site of an earlier Estonian tribal wooden stockade-fort. Viljandi Castle with its nunnery became the residence of the Livonian regional commander, and was one of the most important strongholds in medieval southern Estonia; it shows the town's former importance as a staging post on the east~west trade route, having become a member of the Hanseatic League in early 14th century. 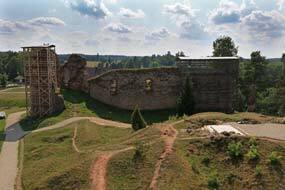 Swedish siege guns destroyed the castle in 1620 leaving just a few fragments of walls (see left) (Photo 11 - Viljandi Castle), but the extent of the remains shows the Castle's impressive scale with the principal Pikk Hermann Tower and two tiers of forecastles preceding it. The entire castle complex covers a prominent castle-mound, surrounded by a deep dry moat, and protected by three outer baileys. 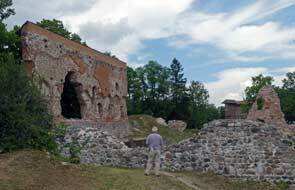 The central area of the caste ruins, which looks out across Viljandi Lake, is now laid out for outdoor theatrical performances with the stage's backdrop formed by the mighty shattered wall of the castle keep. By the Castle outer gate stood one of the traditional Estonian communal wooden swings (kiik in Estonian), seen all across the country (Photo 12 - Estonian swing). The Varese footbridge crosses the dry moat with its glorious tree-surrounded backdrop of St Jon's Church, leading along Lossi Street with its attractive old wooden houses to General Laidoner Square and the town's museum housed in an old pharmacy (see above right). Just beyond, the town's former water tower standing out above surrounding buildings is now converted to an observation tower for views over the town and lake (see left). 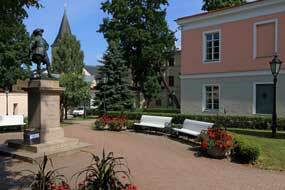 Beside the 18th century town hall, a statue of August Maramaa recalls Viljandi's 1920~30s legendary mayor and benefactor who did much to make Viljandi the successful and attractive town it is today; he was among those deported by the Soviets in 1941 and died in a Siberian labour camp. Returning through a park alongside the town's modern commercial quarter, we found the statue of Carl Robert Jakobson (1842~82) (see right), a radical nationalist writer and politician who founded the Estonian language newspaper Sakala in Viljandi in 1878; the paper's virulent anti-German stance represented a break with the more conservative nationalists led by J V Jannsen. Sakala continues to be published in Viljandi, still bearing the same ornate masthead as in Jakobson's time (see left). Viljandi was such an attractive and civilised town rightly proud of its history, and we had enjoyed our walk around its sights. We now had to turn our attention to the more mundane business of our first provisions shopping in Estonia at the Coop Maksimarket supermarket, which meant re-learning our Estonian shopping vocabulary (eg piima for milk). A day in camp at Vanasauna Puhkemaja overlooking Lake Vörtsjärv: heading east from Viljandi on Route 92 (click here for detailed map of route) towards Tartu, we turned off around the shore of Lake Vörtsjärv to the scattered lake-side fishing village of Valma to find tonight's campsite, Vanasauna Puhkemaja (Guest House); an earlier phone call had confirmed availability of camping at €15/night. We had stayed here in September 2011 and enjoyed a memorably peaceful lake-side camp; it was unlikely to be so peaceful in peak holiday season July. 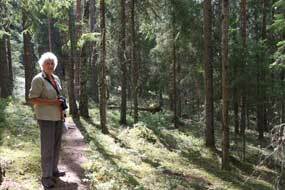 The owner was welcoming and although speaking little English, showed us around to the pine and birch tree-shaded camping area by the lake-shore with its glorious outlook over the shallows of Lake Vörtsjärv (Photo 13 - Vanasauna Puhkemaja) (see left). We settled in with a heavy shower delaying supper, but when the rain had passed we lit the barbecue (see below right). The peace of our lake-side evening was however was not to last, with holiday-making Estonian families making undue noise; with screaming kids still running around at 11-00 pm, enough was enough and we had to demand consideration be shown to other people. After another very hot night, we woke to hazy sun and a breeze from across the lake for our breakfast outside. The forecast rain held off for our working day in camp today, but the weather continued hazy with the lake obscured by mist. But despite the disappointing conditions, the views looking out through the shore-side reeds by the fishing anchorage out over the lake were breathtaking. Facilities at Vanasauna were good with WC/showers in the sauna hut and access to the owner's kitchen for washing up. With all the inconsiderate noise from other guests staying in the huts, regrettably inevitable these days, Vanasauna's hospitable owner ensured they moderate their thoughtless behaviour. The University-city of Tartu: continuing on Route 92 around the head of Vörtsjärv, though screening trees meant few views of the lake, we made good progress towards the University-city of Tartu (click here for detailed map of route). In the south-western outskirts, we pulled into the Lõunakeskus shopping centre, and in the huge shopping mall, we found a Rimi supermarket for a provisions re-stock and a Sports Direct for a replacement pair of trainers for Paul. Heading into the city centre, aiming for a car park we had identified by the river, road closures forced us to drive up and around Toomemägi Hill, but by good chance we found street parking just off Ülikooli (University) Street close to Barclay de Tolly Square; and even better news was that parking was free in Tartu at weekends. The reason for the city centre street closures was that Tartu was this weekend hosting the 4 day European Triathlon Championship with the finishing line and spectator stands dominating the area around where we had parked. There is no doubt that Tartu is one of our favourite European cities (see right and below left)), such a civilised place with its University (see left) and a vibrant feel with its population of young undergraduates. As it happens also, Tartu is twinned with Salisbury, the UK city earlier in 2018 contaminated with deadly nerve agent from Russia's outrageous state-sponsored attempted murder of the Skripals. 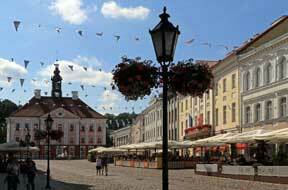 Tartu, or Dorpat as it was known in German, had been the capital city of the diocese covering Northern Estonia and Latvia, an important trading centre, and member of the Hanseatic League since the 13th century. 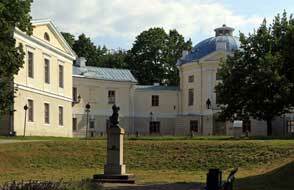 From the time of the 17th century Swedish occupation however, the history of Tartu had been very much the history of its University (Ülikool). Close to the University a statue of King Gustav II Adolphus of Sweden, the University's founder in 1632, stands in a small garden; a degree from Tartu University was a prerequisite to a government post under Swedish rule of Estonia. With the Russian conquest in 1704, the University remained closed until its re-foundation by the Baltic-German aristocracy in 1802 which resulted in a wholesale reconstruction of halls, libraries and lecture theatres, and gave the city the distinguished neo-Classical appearance still seen today, particularly the Main Building with its colonnaded frontage (see right). 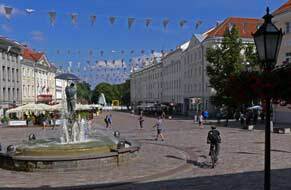 During the 19th century, German remained the main language of academia, but increasingly Tartu became a centre of learning for native Estonian culture and folklore. 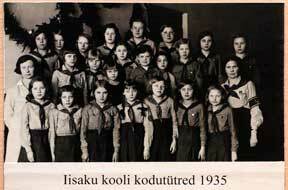 The Estonian Learned Society founded in 1837 was the first organisation to treat Estonian as a serious subject of study. With the Estonian National Awakening, Johann Voldemar Jannsen published the first Estonian newspaper, the Eesti Postimees in Tartu in 1863 and organised the first All-Estonian Song Festival here in 1864. 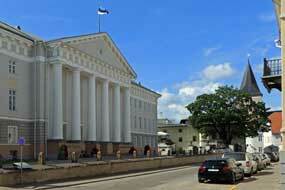 Tartu University students had originated the Estonian flag at Otepää as we were to learn later. But the Tsarist régime responded with increasingly pressured Russification, making Russian the sole language of teaching at the University in 1889. Despite this, the University managed to remain a progressive and liberal institution and women were admitted in 1905. 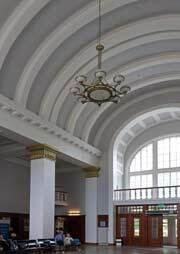 After the treaty granting Estonia independence from Bolshevik Russian rule was signed in Tartu in 1920, the University established itself as the national Estonian centre of learning, with teaching conducted in the native language. 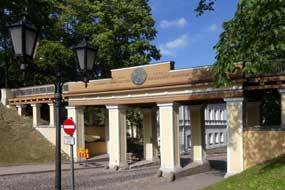 During the Soviet era, academic freedom was severely restricted with communist ideology dictating what was acceptable by way of teaching and research, and the presence of a major Soviet air base made Tartu a closed area, cutting the University off from international contacts. University students were active in the independence movement of the late 1980s and since re-independence, the University has re-established its international standing attracting increasing numbers of overseas students and visiting academics. A sunny summer Saturday afternoon was a lovely time to visit Tartu and as we walked along to Raekoja plats (Town Hall Square) past the 18th century neo-Classical Town Hall (see above left) (Photo 14 - Tartu Town Hall), the city had an even more lively air with the international sports festival in full swing. First stop was the TIC where, as befits a University-city, the staff were a credit to Tartu and answered our many questions with informed enthusiasm; this was in marked contrast with the sadly lacking response we had experienced here in 2011. As we walked down to the trapezoid-shaped Raekoja plats (see left) (Photo 15 - Town Hall Square), one of Europe's most delightfully charming urban spaces with its curtilage of Baroque buildings and the Kissing Students sculpture-fountain (see right), we were just in time to hear the 3-00pm chiming of the 34 bell carillon in Tartu Town Hall's tower. At the far end of the Square, the River Emajõgi flows through the city on its way towards Lake Peipsi, having meandered a sluggish course from Lake Vörtsjärv; it was once spanned by Tartu's elegant Stone Bridge, a gift to Tartu from Catherine the Great in 1784, but after 157 years of service to the city, it was destroyed by retreating Russians and Germans in WW2. 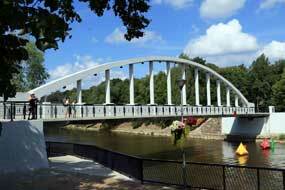 The modern concrete arched substitute bridge is a functional but aesthetically unworthy successor (see left). 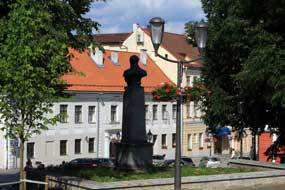 We ambled back through Raekoja plats up to Pirogov Square with its monument to the 19th century prominent Russian military surgeon Nikolay Pirogov who trained at Tartu University (see right); he is considered the founder of field surgery and one of the first surgeons in Europe to use ether as an anaesthetic. From here we headed up Lossi under the Angel Bridge (see below left) towards Toomemägi Hill and the University Observatory (Photo 16 - University Observatory). 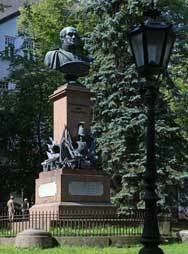 Outside the observatory stood the Struve Monument, commemorating monumental work of Dorpat (as Tartu was then known) Observatory's first Director, Friedrich Struve (1793~1864), which accurately plotted the arc of the global meridian, enabling precise geodetic calculation of the earth's size and shape (see below right). Newton had been the first to suggest that the earth was not a perfect sphere but flattened at the polar extremes. As 18th century technical innovation led to improved surveying and mapping and the development of more accurate navigational instruments, it became more important to determine the earth's equatorial radius and polar flattening with greater precision. Struve organised a major project lasting from 1816~55 entailing international cooperation between the scientific authorities of Norway-Sweden and the Russian Empire. A series of measuring stations was set up along the Tartu longitudinal line of meridian from Hammerfest in Arctic Norway to Ismail on the Black Sea in Ukraine; at each the earth's radius and polar flattening was computed by triangulation, leading to what is now referred to as the Struve Geodetic Arc in honour of the project's instigator. Struve's work was a brilliant piece of scientific enquiry, still of significance in today's GPS dominated world for accurate mapping and navigation. 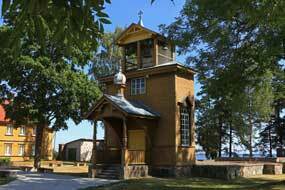 Accordingly the Struve Geodetic Arc, with its first point located at Tartu Observatory where Struve conducted most of his research, is now recognised with UNESCO World Heritage status. So when the question about Struve's geodetic research next comes up in your local pub quiz, you'll be glad you read this account! Past the former Medical school buildings and Anatomical Theatre (see left), we crossed the wooded parkland of Toomemägi Hill. This area above the city was chosen as the site for key buildings of the University at its 1802 re-establishment. The red brick 13th century Gothic Domkirke (Cathedral) topping the hill had been reduced to dereliction by 16th century Livonian Wars, and J W Kraus who designed the new University buildings, chose to leave the skeletal ruins (see below right) as a monument with the chancel converted into a 4 storey library. Today this houses the Tartu University History Museum whose displays document the University's history from its founding by the Swedish king, its 19th century resurrection, its growth from 1919 as the Estonian national University, its tribulations under communist repression and its renewed post-independence freedom facing the financial realities of transition to market economy. The museum is certainly worth a visit, alongside the stark ruins of the Gothic cathedral and the memorials dotted around the wooded hilltop. A night's camp at Kure Turismitalu Külalistemaja (Farm-Guest House): back through Toomemägi's parkland, the hill-side path gave an overview looking down onto the city centre and Town Hall tower among the trees from which the Carillon bells had rung out earlier in the afternoon (Photo 17 - Town Hall tower), we extricated ourselves from the city and set course on Route 2 out to Rahinge village at Tähtvere for Kure Turismitalu Külalistemaja (Farm-Guest House). 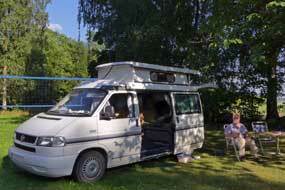 We had no great expectations other than it being the only place we could find to camp in the proximity of Tartu. On arrival it was clear that some sort of party gathering was taking place, seemingly monopolising the camping area. We were greeted by a non-English speaking gent: moment! he said, and called for the lady owner. She looked us over and decided that what she called the 'Happy Garden' was the place for us to camp rather than the lower field filled with the party's camping-cars. We followed her directions around to a very pleasantly laid out garden-orchard above the guest house where we settled in and relaxed with early evening beers in such a lovely garden setting (see left). The lady came round to book us in at the rather expensive price of €22/night, and escorted us (no other word would do!) to point out the facilities in the guest house, insisting on removal of shoes and wearing of overshoes for the kitchen/wash-up. Too exhausted but to go along with all of this, we put her officious, rule-book bound manner down to language limitation and over-placed pride in her guest house; doubtless what came across as maladroit attempts at hospitality were well-intentioned, but less weary and we could well have taken offence at her treatment of paying guests! The elderly party gathering (apparently a school reunion) ballroom-danced away the evening to quaintly geriatric music in the guest house, sufficiently distant as to be inoffensive from our camp in the flower gardens as we barbecued supper and cracked another beer. 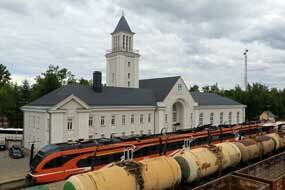 A second day in Tartu: the following morning we drove back into Tartu, passing the attractive wooden railway station and down into the centre. Again luck was with us on a Sunday morning and we found a shady parking space in the same side street. A relay event in the Triathlon Championship was just finishing won by British athletes. Commentary over the PA system was in a mix of English and Estonian, with the British competitors being interviewed. Late morning sunshine filtering down through the trees in the parkland square opposite lit the memorial bust of Barclay de Tolly (see right), the Russian Tsarist general of Scottish descent who had led the defeat of Napoleon's invasion of Russia in 1812. We walked along to Town Hall Square and with sunlight now lighting the façade of the 1780s neo-Classical Town Hall, we took our photos around the square, enjoying the happy ambience and listening to buskers. On a Sunday morning out of term, and with the Triathlon events attracting many people, the streets around the University were peacefully deserted, as we photographed the Von Bock House with its end wall mural of the University buildings (see left). 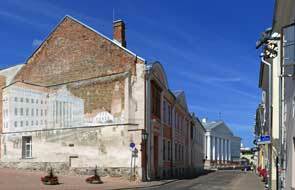 The far end façade of the building was subtly decorated with painted groups of University staff who appeared to gaze from trompe l'oeil windows overlooking the grandly impressive colonnaded frontage of the University Main Building (Photo 18 - Tartu University). Just around the corner, a statue commemorated Jan Tönisson (1869~?1941), editor of the Eesti Postimees newspaper and leading Estonian statesman who was arrested and deported by the Soviet occupiers in 1940; his fate and date of his death in Siberia are unknown. To the rear of the Main Building, we sat on a bench for our lunch sandwiches in the shady gardens by the statue of the University's 1632 founder, Swedish King Gustav II Adolphus (see right) (Photo 19 - Gustav II Adolphus). Along the street under Toomemägi Hill's wooded slopes stood the attractive wooden Theatre House puppet theatre (see left), a building which survived Tartu's Great Fire of 1775 and WW2 destruction. Down Lutsu Street, we reached St John's Church (see below right) whose monumental red brick Gothic structure has been magnificently restored after WW2 destruction; ironically this was closed on Sundays! Around in Munga Street, the Uspensky Apostolic Orthodox Church of the Ascension of Mary was not only closed but looked in a sadly woebegone state. 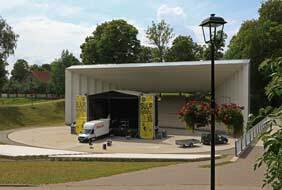 Before leaving the city, we wanted to make a re-visit to Tartu's Song Festival Grounds and Arena, and set a course back along past the railway station to avoid the central closed streets. Streets on the parkland hillside overlooking Supilinn and the river close to the Song Festival Grounds were also closed off for a junior cycling event, but with help from the young conscript marshals we managed to park and walk up the hill to find Tartu's Song Festival Arena. 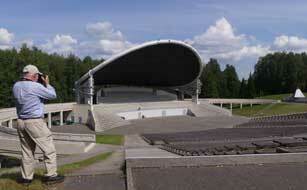 The stage can accommodate choirs of up to 5,000 singers, and the huge amphitheatre has seating for 15,000 spectators; it was built in 1994 into the natural slope of the hill-side for the 125th Song Festival, to symbolise Tartu's place in the Estonian choral tradition (see left) (Photo 20 - Song Festival Arena). Although empty and silent today, the thought of this dignified arena resounding to singing from massed choirs gave embodiment to the Estonian choral tradition. As we walked back, the young riders came through, struggling up the steep hill. Estonian Aviation Museum: we just about had time this afternoon to visit the Estonian Aviation Museum to the SE of Tartu, and set a course around the A2 to the far side of the city turning off in the outskirts on minor country lanes to reach the museum. The museum was the initiative of Estonian engineer and former politician Mati Meos and opened in 2002, with a private collection of 23 mainly military aircraft, mostly from the Soviet Union and former Warsaw Pact countries of Poland and Ukraine. These included: the huge twin-engine MiG-25 supersonic interceptor (Photo 21 - MiG-25 supersonic interceptor), one of the world's fastest aircraft capable of speeds of up to mach 3 (3,470kph), the MiG-23 fighter-bomber, and MiG-21 fighter with a rate of climb of 13,800m/minute (see right); the Sukhoi Su-22 fighter-bomber, and Sukhoi SU-24 attack aircraft (Photo 22 - Sukhoi Su-24 all-weather attack aircraft), still in service with the Russian air force; the Yakovlev Yak-28 fighter aircraft; a huge Mil Mi-8 military transport helicopter (see below right). 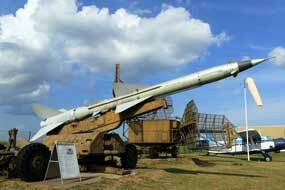 At one end of the hangars, Soviet surface-to-air missiles were displayed including those armed with nuclear war-heads that were based in Estonia during the Cold War; these included the S-75 Dvina missile, one of which shot down Gary Power's high altitude U2 reconnaissance aircraft in 1960, and the S-200 very long range missile with 4 solid fuel rockets, reaching speeds of Mach-8. How Mati Meos had been able to acquire the Soviet aircraft was a question that remained unanswered due to language limitations. The aircraft collection has been expanded in recent years with Swedish military aircraft from the Lynköping Aircraft Museum in Sweden; these included the Saab Draken, Lansen and Viggen. 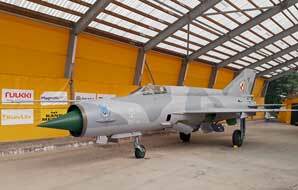 The Estonian museum had also acquired a US F-104 Starfighter and F-4 Phantom, a French Mirage, and an ex-RAF vertical-take-off Harrier Jump Jet and Hawk trainer. Although none of the aircraft is now in airworthy condition, the whole collection is now displayed in a series of semi-open hangars well-lit by natural light from translucent roof-panels, and well-presented with detailed information panels in both Estonian and English; it really was an impressive collection and certainly worth a visit. Waide Motel Camping at Elva: from the Aviation Museum, we worked a way across country eventually joining the A3 south-westwards for some 30kms toward Valga (click here for detailed map of route) to reach tonight's campsite the Waide Motel Camping near the small town of Elva. Again we had no great expectations of what appeared a typically featureless motel with attached campsite alongside the main road; the county of Tartumaa was poorly served with campsites and this was the only option in this area. In fact however we were received with a smilingly helpful welcome from the receptionist, who readily agreed a camping card discount on the usual €20 charge to pay €18. 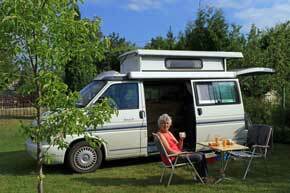 The large camping area, deserted apart from one other caravan was tree-shaded along one side. Facilities were good, with WC/showers, wash-up and washing/drying machines, and included wi-fi just reaching the camping area. It was a good standard 'does-what-it-says-on-the-tin' site. 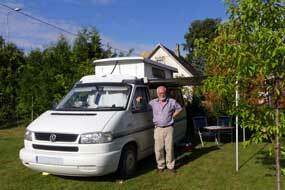 The only downside was the constant traffic noise from the nearby busy A3 main road. 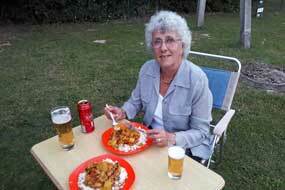 We wearily settled in, cooked supper and sat outside on a hot evening to eat it (see left). 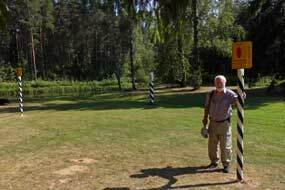 Otepää Flag Museum: another hot, sunny day, and having enjoyed a shady camp last evening, this morning we were in full sun. Before leaving Waide Motel Camping, we telephoned the TIC in Otepää; speaking in fluent English, the lady promised to arrange for the Flag Museum to be open for us this afternoon. We needed to shop but there was no time to stop this morning in the small and undistinguished town of Elva, and we continued across country on minor roads to join Route 71 towards Otepää with the sun unbearably hot. The terrain became increasingly hilly as we approached Otepää, a winter skiing resort but also a town with long associations with the history of Estonia's blue-black-white tricolour national flag. We parked in the square by the bus station, and true to her word, the TIC lady had arranged for the Flag Museum to be opened for us. 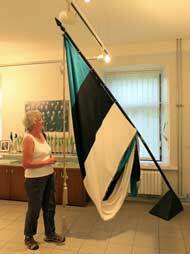 The origins of the Estonian tricolour blue-black-white flag (see left) date back to the time of the 19th century Estonian National Awakening when the concept of independent nationhood was beginning to emerge. The story begins in 1884 with the Tartu University Estonian Students' Society needing distinctive coloured caps and sashes for formal recognition of student rights, in rivalry with the more predominant German student societies. The minority Estonian students met secretly in Tartu to consider the issue, agreeing that the colours should embody the character of Estonian landscape, culture and traditions: blue symbolising faithfulness and hope for Estonia's future, black the dark past which would be left behind, and white the snows of winter, light of summer and attainment of enlightenment. Having selected the colours, the students' wives and girlfriends stitched together pieces of silk to make the first flag. Every flag needs to be blessed, but none of the Tartu clergy would take the risk of involvement in such a seditious enterprise, fearing reprisals from the ruling Russian authorities. 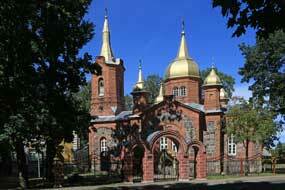 One of the students knew a compliant priest at Otepää, far from the probing eyes of Tsarist agents. The Estonian Students' Society accordingly processed from Tartu to the remote town where the obliging priest made his rectory available for the flag to be ceremonially consecrated; the flag subsequently received blessing at a ceremony by the sacred waters of Lake Pühajärv. From this small event by romantically minded students, the tricolour-flag assumed increasingly symbolic significance and by the end of the 19th century it was displayed at ceremonial occasions. 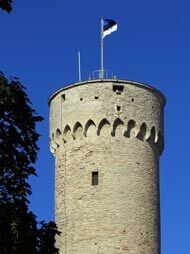 Its first political appearance came in 1917 when 1000s of Estonians waving the tricolour demonstrated in St Petersburg demanding national independence, and following the 1918~20 War of Independence, the flag was formally adopted as the national emblem of independent Estonia and raised on Pikk Hermann Tower at Toompea Castle in Tallinn. During the Soviet occupation, the flag was banned and its possession was an offence punishable by deportation to Siberia. It was however secreted away as a symbol of hope of one day regaining independence, and the original 1884 flag buried in a sealed box. As the USSR teetered on the brink of collapse in 1989, the national blue-black-white flags were brought out, and since February 1989 once again it flies daily on Pikk Hermann Tower as a powerful symbol of Estonia's independence (see above right). 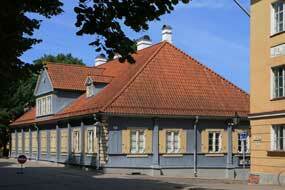 The rectory at Otepää where the original 1884 consecration of the flag was performed now houses the Estonian Flag Museum (Eesti Lipu Muuseum). No one was about when we arrived but the door had been left open for us; the building however was now in a rather neglected and woebegone state. The one room museum displayed a replica of the original silk blue-black-white tricolour flag (see right) (Photo 23 - Replica of original 1884 flag), and the other corner showed an impression of the wooden box secretly buried in a brick wall during the Soviet occupation. Information panels recounted the history of flag's origins, its recognition as newly independent Estonia's national flag in 1920, its banning and concealment during the dark years of Soviet occupation, and its second apotheosis in 1991 as national flag, to fly again from Pikk Hermann Tower in Tallinn. These unassuming displays again filled us with admiration at the Estonian people's proud resilience in the face of Soviet repression. 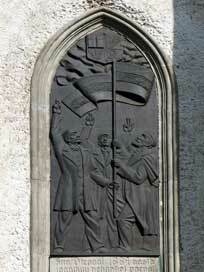 Across at the parish church, bronze relief panels each side of the doorway depicted the 1884 pledge of allegiance to the flag (see left) and a symbolic family enjoying life in a free Estonia. The commemorative plaques had been installed at the church in 1934 during the 50th anniversary celebration of the original flag-blessing; the panels had been cemented over by the communists but were restored after independence. Valga and Valka, a divided town spanning the Estonian~Latvian border: after a hot, sticky and airless night, the sun rose early above the trees, bringing us into full sun again; it was going to be another insufferably hot day. In this summer's freak heat-wave conditions, temperatures in Northern Europe and particularly Scandinavia were 3~5°C above normal. 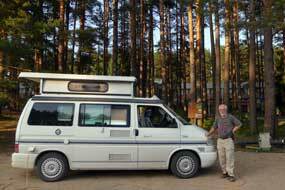 This morning, with joy in our hearts about leaving this disgusting campsite and its uncouth owner, we set off on the 16kms of tarmaced lane through lovely spruce forests to emerge in the outskirts of Valga (click here for detailed map of route). 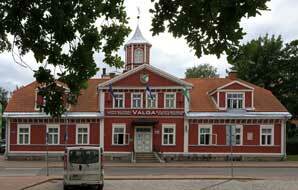 Valga had since the 13th century been a small provincial town, multinational in nature with a mixed population of Estonians, Latvians, Germans and Russians. The coming of the railway linking Rīga and Pskov via Valga in the late 19th century had brought rapid expansion to what now became a railway hub. Industrialisation attracted large numbers of Russian-speaking workers to Valga where a huge railway workshop depot developed as the town's then largest employer. At this time relations between the ethnic groups remained cordial. In 1917 with the overthrow of Tsarist Russian Empire, which had previously governed Northern Latvia and Southern Estonia as a unified entity, there seemed to be an obvious line dividing most of the region between towns of majority-Estonian and majority-Latvian population, to indicate a natural line for a new border between the two countries when they achieved independence from Bolshevik Russia in 1919. Valga however with its mixed Estonian~Latvian population, was of too great strategic importance as an industrial and railway junction town for either the Estonians or Latvians readily to give it up to the other. As a result, the border-town of Valga was the only place where Estonia and Latvia came into serious contention over the exact line of the border. It was only the mediating intervention of a British Foreign Office diplomat, Sir Stephen Tallents on behalf of the League of Nations, who settled the dispute; war was prevented by imposing the current border line which now divides the towns of Valga on the Estonian side and Valka on the Latvian side. But the seemingly arbitrary border line, which followed the insignificant Pedele stream through the centre, divided the town into disproportionate parts: the Estonians gained the railway station (the reason for the town's importance), most of its industry and a greater share of the centre, while the new Latvian town of Valka was reduced to an insignificant size causing great resentment. During the Soviet period the border became an irrelevance, and the Soviet military presence from 1944~90 made Russian the prominent language in Valga~Valka. When the two countries however re-achieved independence in 1991 after 50 years of Soviet occupation, the border line was re-instated and all links between the two towns were severed. Relations remained strained with strict border controls operated between the two parts of what had historically been one town. Even hospital patients could not be brought across since neither country recognised the other's health insurance. It was only in 2005 that EU membership injected some common sense and compelled greater cooperation between the two town authorities as the price of financial subsidies for joint tourism initiatives under the slogan One city, two states (Üks linn, kaks riiki in Estonian). The website The Strange Story of Walk – United by the Soviets, divided by freedom makes interesting reading, with a detailed account of the history and impact of the divided towns of Valga and Valka. 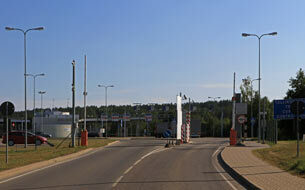 Only with the Schengen agreement in 2007 were the border controls finally removed and an open border achieved. The border line, now entirely open with no remaining border controls or fences, runs through the centres of the two neighbouring parts of what was once one town, with local people passing to and fro freely to work and to shop via three road crossings, two for local traffic between the town centres, and one for heavy traffic in the suburbs. Cooperation however between the town authorities of Valga and Valka on the two sides of the now open border remains something of a reluctant tokenism. The two towns now have a combined population of 19,000 (14,000 on the Estonian side and 5,000 Latvian), with 4 languages spoken: Estonian, Latvian, Russian (Russian speakers still form 33% of the population on both sides of the border), and English providing the lingua franca for the young born since re-independence. Our first impressions, as we drove down Valga's main street was the woebegone and neglected state of its once attractive wooden buildings (see above right and left) and even more sorry state of its modern apartment blocks. Between these, larger areas of open parkland green spaces relieved the town's rather gloomy appearance. 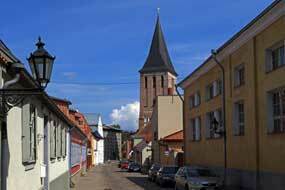 We reached the central area of Kesk and parked by the much neglected St John's Church to walk across to the maroon-painted wooden Old Town Hall which houses the TIC (see above left). 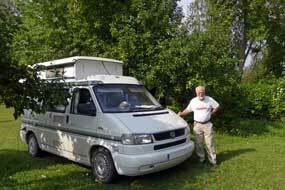 We had earlier phoned to enquire about camping potential around Valga and had learned of the Aare Majutus (Guest House) which offered camping in their gardens. 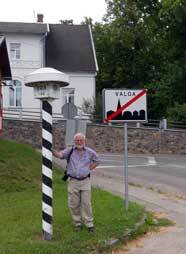 The helpful girl at the TIC phoned to reserve us a place, and having secured a town plan of Valga~Valka (duly headed by the One city, two states slogan) and details of the border line dividing the town centres, we drove out to Aare Majutus in the northern residential suburbs to inspect the place. 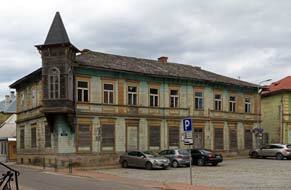 Before leaving the centre, we walked around to examine what had once been attractive wooden houses. Reaching Aare, the owner was expecting us and showed us around; the garden camping area was delightful and we reserved a place among the blackcurrant bushes. There was a fully equipped kitchen/wash-up and common room with WC and shower in the guest house, fully fledged wi-fi, and all for the price of €15/night. What a stunning contrast with the sordid, fly-ridden dereliction of last night! We should return after after visiting the town. 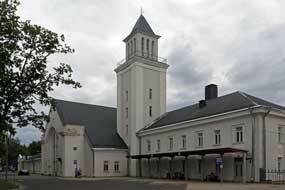 First stop was Valga's railway station. The original brick-built station had been destroyed in WW2, and the modern architectural grandiose anachronism was built by German POWs in 1949 during the early years of Soviet occupation (see above right). It had all the lavish flamboyance of Soviet buildings of that era, with a huge tower, grandiose entrance hall with chandelier and balconies (see above left). The long footbridge spanning sidings filled with freight wagons and oil-tankers, which linked to apartment blocks on the far side of the tracks, gave an overview of the station buildings (see left) (Photo 24 - Valga railway station). A modern diesel railcar stood at the platform waiting to depart for Tartu. Before Schengen in 2007, the presence of the border with Latvia had meant a change of trains and passport control here if travelling from Tallinn to Rīga; Valga served as terminus for both state railways. Today's timetable showed no departures southwards now into Latvia, only local services to Tartu and Tallinn via Tapa, and an evening train to Narva but no indication of this continuing to St Petersburg. 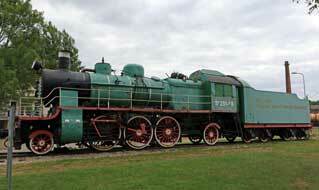 Just along from the station, a surviving Soviet Su Class 2-6-2 steam locomotive was preserved on an isolated section of siding, as a monument to celebrate the 110th anniversary in 1998 of the opening of the Rīga~Valga~Pskov railway. Built in the Russian industrial shipyard town of Sormowo in 1949, the engine looked a woebegone and primitive machine compared with the far more sophisticated British and Western European steam locomotives of that post-war period (see above right) (Photo 25- Soviet Su Class locomotive). Further towards the centre, we parked at the Maxima supermarket, and just opposite we found the now locked and neglected Issidor Russian Orthodox Church (see left), dating from 1880 with the influx of Russian industrial workers to Valga. The church had suffered during the Soviet years, and now looked to be permanently closed with the building of a new Orthodox church in Valka. Before shopping for provisions at the Rimi supermarket on the Estonian side of the border, we decided to venture across into Valka and crossed the open border. We paused in Valka main street at the separate Latvian TIC for a street plan of Valka, and from this found a Mego supermarket in the outskirts of the Latvian town to buy Latvian beers (so much preferable to Estonian beer!). The absence of formal border controls enabled traffic to pass to and fro at will, and we returned to Estonia to complete our shopping at the Rimi. It was evident from the number of Estonian cars parked at Latvian Mego and Latvian cars parked at Estonian Rimi, that locals now regularly cross the border to shop in the other country's supermarket. Leaving George parked in Estonia at the Rimi car park, we walked back over the border into Latvia for photos standing by the border-post markers (see above right), with one foot in either country (see left). The respective Estonian and Latvian border-marker posts still stood either side of the little Pedele stream which Tallents had in 1920 marked on his map as the line of the imposed border between the two countries (Photo 26- Border markers); since 2007 the border fence had now been removed. And realising that diesel was considerably cheaper in Latvia, we drove back across the border to top up George's tank, paying €1.20/litre in Latvia compared with €1.33 in Estonia! Returning to Estonia via the other local border crossing, we paused to photograph what remained of the once rigorously enforced border control-point, where before 2007 residents of Valka and Valga had to pass through passport control to visit relatives in neighbouring streets either side of the border, with different currencies, different languages, and different cultures and legal systems in the two parts of the one town with two names, Valga and Valka. 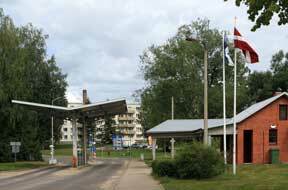 Traffic now passed freely to and fro between the two town centres, but the Latvian and Estonian flags flying side by side over the now redundant border-post seemed something of token symbolism (Photo 27- Redundant Latvian~Estonian border-post) (see above right). The reality of mutual cooperation between the two town authorities, and the true meaning of One city, two states remained uncertain. Both towns on each side of the border showed signs of neglect in today's economically difficult times, with the sad and rundown state of their buildings, though efforts were being made to tidy up the public spaces and open parkland. Wage levels in Valga are some of the lowest in Estonia and the level of unemployment in this once industrial town is 8.3%, one of the highest in Estonia compared with the national average of 4.6%. Despite this, economic conditions in Valga are more favourable than in Valka, and many Latvians cross the border daily to work in Valga where employment prospects are greater than in its smaller, even more depressed Latvian neighbour. What a curious day this had been for us, crossing at will back and forth between the two contrasting but unequal parts of Valga~Valka's One city, two states. Aare Majutus (Guest House) Camping: we re-crossed into Estonia and returned in the now hot sunshine to Aare Majutus (Guest House) Camping to settle into our garden pitch (see right), pulling out the awning as additional shade from the full sun, and taking full advantage of Aare's first rate facilities to chill our beers in the kitchen's fridge-freezer, another first! After a sultry hot night, early cloud broke to give another sunny day, enabling us to sit out for breakfast in Aare Majutus' lovely gardens (see left) (Photo 28 - Aare Majutus Camping). In her limited English, the kindly owner showed us one of the guest-rooms for us to use the shower; the B-and-B rooms were of a high standard and the shower was the most homely and civilised of the whole trip. Without doubt Aare Majutus-Camping was one of the trip's finest campsites: lovely, hospitable owners, beautiful garden setting, excellent facilities, and such good value at just €15/night. 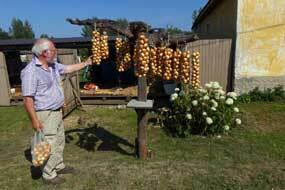 If you are in the Valga area, make a point of staying there. 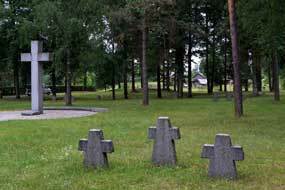 Valga~Valka's wartime and Cold War sites: before leaving Valga~Valka this morning, we wanted to visit some of the two towns' historical sites associated with WW2 and the Cold War. Re-crossing the border into Valka, close to the town centre and some sadly neglected apartment blocks, we found a row of three elongated, artificial mounds, with a concrete entrance way, locked metal doors, and ventilation shafts protruding from their tops. These were the remains of an underground complex of concrete military bunkers constructed by the Soviets in Valka during the 1950s Cold War (see left). These housed a missile command and control centre which coordinated all the Soviet missile sites scattered across the Baltic States, such as the one we had seen at Plokštinė in Lithuania, from which missiles would have been launched against the West at a time of international crisis. If the Cuban Crisis in October 1962 had escalated, the Soviet military response would have been coordinated from here. Although now inaccessible and derelict, they remain here, a chilling blot an Valka's urban landscape close to the town centre, a permanent ugly feature of daily lives for Latvian residents as they pass by on their way from apartment blocks to the shops (see right). From here we made our way out to Valka's northern ring road where, alongside a Latvian civil cemetery, a small German war cemetery with token numbers of stark Teutonic crosses marked the mass burial ground for the 100s of German troops killed in the battles to re-take Valga from July~September 1944 (see below right). It took the Red Army 3 months to dislodge the Germans dug in here. Similar numbers of Russian soldiers were killed in the fighting, and these were buried in mass graves on the far side of the town where we now drove. Unlike other Soviet war cemeteries, this one was remarkably modest in style, with a 1980s monument (see left) and names of the dead inscribed in Cyrillic around the low outer walls (see below right). We finally re-crossed the border-post into Estonia and drove back up Valga's main street past the traffic lights; it says something about a place when its one set of traffic lights gets a specific mention in the town's tourist literature list of sights worth seeing! On the northern outskirts of Valga just before crossing the modern railway line to Tartu, the remains are still just about visible of Valga's once huge railway workshops and engineering depot which must have been the town's biggest employer. The rows of sidings filled with oil tanker wagons which we had seen at the railway station extended into the former area of workshops. All that remained now however of the depot looked to be a few large Nissen huts and derelict concrete buildings. Just off the road north of the workshops area was the site of a WW2 POW camp where the Germans held Russian POWs. An estimated 29,000 Russian POWs died here of starvation, cold and disease, and the map showed a military cemetery where these were buried. In late 1944 after the costly re-capture of Valga, the Red Army took over the prison camp where in turn many German POWs died. Unfortunately there was no time today to visit the site. Lake Ähijärv in Karula National Park: we returned through the spruce forests to Laatre and turned eastwards on tarmaced Route 129 for 17kms to the small town of Antsla (click here for detailed map of route). From here a winding lane led south to Haabsaare, and finally 4kms of gravel road brought us to Ähijärve and the Karula National Park Centre. 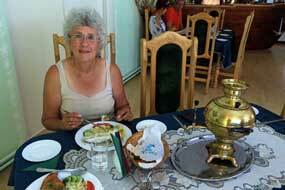 The lady here spoke good English and supplied information and map-leaflets about the 4kms Ähijärve walking route. More importantly, she assured us we could camp by the Visitor Centre where there was a water supply and 2 earth privvies; she even agreed to our taking power from the barn which housed a rural museum exhibition. We brought George round, plugged him into the power supply for his fridge full of food in today's torrid heat, and set off down to Lake Ähijärv to begin the walking trail. The way-marked path curved around the lake past a farm with traditional wooden buildings including a smoke sauna. Across lake-side meadows, it entered the forest on Lake Ähijärv's northern side, passing boat moorings (Photo 29 - Lake Ähijärv) (see above left) and a former wooden mill destroyed by fire in 2012. Around the far side, the path climbed steeply up into the forest and curved around to reach a forest road by a brook which drained from a hay meadow, described on an information panel as a drained former lake-bed separated from Ähijärv by the forested esker we had just crossed. 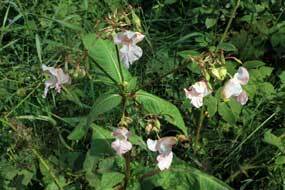 Indian Balsam (Impatiens glandulifera) with its untidy pink flowers flourished in the moist ground alongside the brook (see left). The entire topography of Karula National Park was made up of moraine hillocks and eskers, formed as the ice sheets withdrew scouring the landscape at the end of the last Ice Age. A loose sandy track climbed up through pine forested heath land before the way-marked route turned off to climb steeply over the esker again. This was by far the most attractive part of the route, following a former cart track which had once connected farms; the forest floor was covered with Bilberry, Lingonberry and Cow-wheat. The path now joined another forest road by a derelict wooden building which had once been the Ähijärve village shop. The path then led down to the lake-shore start-point and back to the National Park Visitor Centre. Camp at Karula National Park Visitor: we set up George under the shade of a magnificent oak tree by the barn (Photo 30 - Camp in shade of oak tree) (see above right). The National Park lady called by to say she would have to lock the barn, trapping our cable, but would open up again in the morning. As the year moved on, dusk was now falling earlier so that soon after 10-00pm it was beginning to get dark. The following morning, a bright sun rose early beyond the deep shade of our oak tree. We breakfasted and washed up at the picnic table under the oak tree, and the Visitor Centre lady called by again to ask if we had enjoyed a peaceful night, and to say the barn was now unlocked enabling us to retrieve our cable. This had been kindness itself; we could not have asked for more. Peräjärve Forest Trail in Karula National Park: in spite of having a busy day ahead in Võru, we decided to add in the 4kms Peräjärve Forest Trail in the southern part of Karula National Park as recommended by the Visitor Centre. 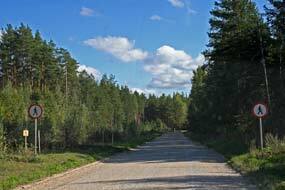 This meant taking the southern 15kms section of gravel road down to join the main Route 67 to Võru. 5kms along, we pulled into the parking area by the tiny settlement of wooden houses that made up the village of Peräjärve. Leaving George in the shade of trees, we set off for the circular walk around the undulating forest landscape of southern Karula National Park. We had no detailed map and had to rely for navigation on an outline map photographed from an information panel with its numbered info-panels references as principal means of route finding. The path initially dropped down through dense spruce forest to the small lake of Peräjärv (see above right), with the ongoing path contouring around a steep-sided depression leading along the forested Hundiauk valley (Photo 31 - Peräjärve Forest Trail) (see above left). The topography was classically that of post-glacial sedimentation: as the ice sheets withdrew and fragmented, sand and gravel deposits were eroded into eskers and cupola hillocks with valleys between them, to form the undulating now forested landscape over which the route circled. It also illustrated the different forms of forestation: pristine, natural dry heath spruce forest, and cultivated, more regular planted pine forest. At the same time, this complexity of surface structure with differing humidity, light, and land fertility gave varied mosaic of forest types: dry and sandy on the higher slopes, wet and boggy in the valley depressions. The National Park aims to protect the natural forests from over-exploitation. The path looped around to another forest track (see right), before branching off over hilly eskers, dipping down again past peaty mired deep depressions and steeply up over a complex series of eskers and cupola-hillocks through pristine forest preserved from human intervention by the complex land relief which made it too difficult to work. 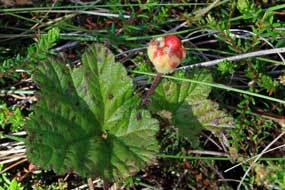 At one point Sheila recognised a parasitic plant growing in the forest floor from its straw-coloured stems and vestigial triangular scale leaves. Despite the parasitic plant's now dead flowers, with her impressively encyclopaedic botanical knowledge, Sheila even identified it as Common Broomrape (Photo 32- Common Broomrape) (Orobanche minor). Completely lacking chlorophyll, Broomrape cannot photosynthesise its own nutrients and is totally dependent on other plants; its seeds remain dormant in the soil, often for many years, until stimulated to germinate by compounds produced by living plant roots. Broomrape seedlings put out a root-like growth, which attaches to the roots of nearby hosts; once attached, the broomrape robs its host of water and nutrients. 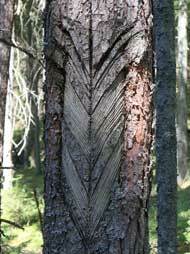 The final section of the path showed further signs of human intervention with downward arrow-shaped cuts in the pine bark, once used for collecting pine-resin (see left), a valuable commodity for caulking wooden boats. 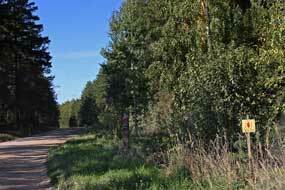 The return route led along a dry and sandy forest road, passing an open area of forest where sunlight encouraged the flourishing growth of Lingonberries (see right) and Bilberries, both laden with ripening fruits. 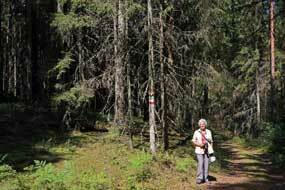 Looping back towards the parking area at Peräjärve village, we passed the only other walkers seen today, a group of Finns from Helsinki who had seen George's GB registration and expressed amazement that we had driven all the way from UK! A disappointing visit to Võru: this had been a great walk through the Peräjärve forests, but we now had 10kms of gravel road to drive to reach the main Route 67, raising clouds of fine, penetrating dust which filled all of George's crevices and vents (click here for detailed map of route). Joining Route 67 near Kallaste opposite the road leading down to the Latvian border at Ape, this was the southernmost point of Estonia we should reach. 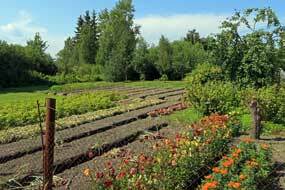 On a very hot afternoon with temperatures in the low 30°s, we now turned NE-wards for a wearying 30kms drive up to Võru passing through featureless agricultural countryside. Reaching the outskirts of Võru, we turned off into the town. Võru is a comparatively modern provincial town, founded and planned by Russian Empress Catherine the Great in 1780s in this hilly SE corner of Estonia, bordering onto Russia and Latvia. Võru's principal claim to fame is its connection with F R Kreutzwald (1802~82) who is considered the father of Estonian national literature, and who practised as a doctor in Võru for 40 years after graduating in medicine at Dorpat (Tartu) University in 1833 (see left). 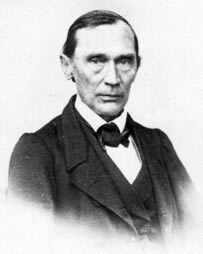 As one of the leaders of the National Awakening, Kreutzwald promoted the nationalistic revival of the Estonian language, taking his inspiration from the example of Elias Lönnrot, the contemporary fellow country doctor and nationalistic author of the Finnish national epic in 1830 of Kalevala (Click here to learn about the Kalevala). 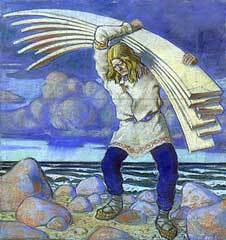 Kreutzwald is best remembered as the author of the 20,000 verse epic poem, Kalevipoeg, about the adventures of the mythical hero giant from Estonian oral tradition folklore legends (see right). It was originally published in German because Tsarist censorship delayed an Estonian edition. 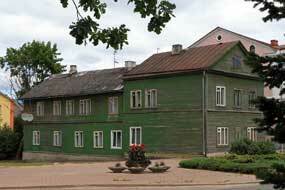 The Kreutzwald Memorial Museum in the Võru house where he practised as town doctor and wrote his epic poem commemorates his life and work. There is little else of note in Võru but we had enjoyed a memorable visit there in 2011 thanks to the town's noteworthy TIC; we had looked forward to this year's re-visit. As we approached however, the entire town centre's grid plan of streets was totally blocked off to both traffic and pedestrians by mammoth road works. We managed to find shady street parking, but being prevented from approaching the central Catherine Church (named not after the Saint but the town's founder Catherine the Great), we walked down Kateriina Street to the Kreutzwald Memorial, where the statue of Võru's notable citizen sits gazing out over the town's lakeside beach (see below right) (Photo 33 - Kreutzwald memorial at Võru). 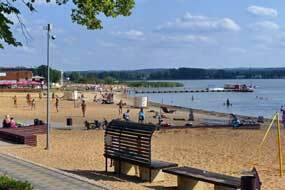 The deep shade of the lakeside park's trees brought welcome relief from today's exhaustingly torrid heat, and while youngsters played volley ball on the beach (see left), we sat under the trees for an ice-cream. Back up Koidula Street towards the centre, a portrait of Estonia's famous 19th century authoress Lydia Koidula decorated one of the wooden houses. The only noteworthy monuments in the central square by the Catherine Church, one to Estonian freedom fighters during the War of Independence, the other to the 17 Võru city councillors killed with the 1994 sinking of the Baltic ferry Estonia, were totally inaccessible due to the all-pervasive road works. Even worse, we had to walk around apartments for several residential blocks to get back to George parked on the far side of the square. For a town that has little or nothing to attract visitors in the first place, this was an own goal of monumental proportions closing off the entire town centre in the height of summer! Kubija Hotel-Camping at Võru: we drove round to the Maksimarket to stock up with provisions; at least the supermarket's efficient air-conditioning brought some relief from the exhausting heat. 4kms to the south of the town, we reached tonight's campsite attached to the Kubija Hotel. In 2011, we had been impressed that this hotel showed the same level of courteous welcome to those staying at its attached campsite as to its hotel guests. So often with campsites attached to hotels, campsite guests are treated as second class citizens; here however we had received exceptional welcome from the English-speaking hotel receptionists who insisted that we were as much guests as those at the hotel, deserving the same hospitality. So refreshing, and again we were received with commendable courtesy from the ultra-helpful reception staff. The pleasant lawned camping area in the grounds of Kubija Hotel were screened off by pine trees, and we settled under these which at least gave some morning shade (see above left). We sat in the shade of George with the sun's heat still unbearably enervating, as week-enders' caravans piled in with all the usual hullabaloo; it was far busier than expected. The sun finally dipped, but as darkness fell later, the surrounding pines restricted the outlook, obscuring the sky and preventing any views of tonight's blood moon and total lunar eclipse. Suur Munamägi, highest point in Baltics at 318m: another steaming hot morning, and plans for today were to explore the hilly countryside of Haanja Nature Park. We headed south on rural lanes (click here for detailed map of route) for some 12kms to reach Haanja, and just beyond the village we reached the parking area for Suur Munamägi, an otherwise insignificant wooded hill but noteworthy as the highest point in the Baltics at 318m. 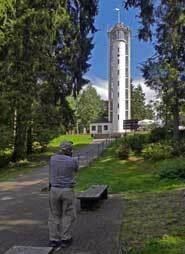 An Art Deco observation tower built in 1939 adds a further 30m to its height (see right) to give panoramic views above the tree-tops over the surrounding countryside towards the Russian and Latvian borders (see left) (Photo 34 - Suur Munamägi). 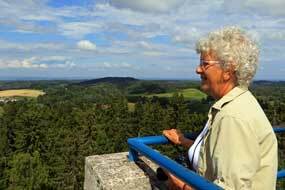 From the approach path, the tower's lift takes visitors (free of charge for us pensioners) up to the observation platform, for the open views in all directions over the forested hilly landscape. To the north the neighbouring hill of Vällämägi stood out above the otherwise featureless terrain. Back down to ground level, our next stop was the parking area 2kms north for the walk over and around Vällämägi hill, Estonia's second highest point just 14m short of Suur Munamägi at 304m. By good chance, we had picked up a map-leaflet detailing the route. The approach path led up the wooded lower slopes and across the hill's eastern flanks to reach an enclosed area of peat bog, with peat 17m deep. Again this topography of glacially deposited hills and intervening marshy valleys dates from the immediate post Ice Age retreat of the ice-sheets. Vällämägi's height may not be great, but the slope of its domed summit on the NE side has a gradient of 40°. The ongoing path beyond the marshy depression up to the forested summit dome tackled this gradient, and with the aid of a securely fixed guide-rope, we hauled ourselves hand-over-hand up the slope through the trees. The gradient eased as we broached the summit dome onto its flat top, but the dense tree cover denied any views; our photos could have been taken in any woodland setting! (see right). The ongoing path continued along the crest of the saddle-shaped hilltop, branching into several directions on the more gentle northern slopes with the main path descending the still densely wooded northern flank. The return path contoured around the hill's lower western slopes through once managed spruce forest, then natural varied woodland to return down to the parking area. Nothing spectacular, but this had been an enjoyable couple of hours walk over the forested hill of Vällämägi. A walk around Rõuge village: we now set course for Rõuge village 10kms to the west on a lane winding through partly wooded agricultural countryside. 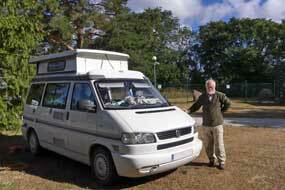 We parked by the TIC above the village where an observation tower stood on the brink of the steep valley-side overlooking Suurjärv lake. More of a tourist souvenir shop, the TIC could not even supply a local map, and we set off for an hour's walk down into the valley and around the village to the far side of the lake to reach a fish farm advertising forelle (trout). The fish were caught from ponds, killed and cooked for customers; unable to resist fresh trout, we enquired and the owner netted a 2kgm fish, and filleted it for us to take away (see left) - but the price! We should prefer not to recall what we paid for the 2 enormous fillets, but there was more than enough fish for 2 suppers! With our heavy bag of fresh fish, we followed the path alongside the iron-rich stream under the steep valley-side and back up the slope to the parking area. A day in camp at Kubija Hotel-Camping: back to camp, we re-pitched at the Kubija Hotel campsite and grilled forelle fillets for supper. Given its price, it was doubly delicious! We stayed a further day here (see right) to make use of the excellent facilities including laundry, luxurious showers and free use of the sauna. The hot sun topped the pines and this afternoon George's internal temperature reached 35°C despite having all the blinds drawn, doors and windows open and fans on; this summer's heat wave made it airlessly hot! Setomaa, the land of the Seto people: from Võru we turned off Route 65 onto the tarmaced minor Route 130 for 25kms eastwards to reach the village of Obinitsa in Setomaa, the land of the Seto people in the far SE corner of Estonia (click here for detailed map of route). The Seto were a branch of the original Finno-Ugric Estonian nomadic tribes who settled in the Baltic lands around 5,000 years ago. In medieval times the Setos fell under the jurisdiction of the Russian principality of Pskov, unlike the rest of Estonia which was subjugated by Germanic Barons. 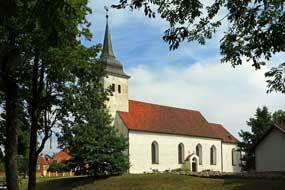 As a result, the Setos were eventually Christianised as Orthodox and not Lutheran. But despite their isolation, the Setos were never fully assimilated into Russian culture, retaining their own distinctive culture and Uralic language, a dialect closer in form to Old Estonian than the modern Estonian tongue. But it is the 20th century history of the Setos, culturally and politically, which is the most interesting and tragic. All of the 12 Seto nulks (tribal units) were contained within independent Estonia between 1920~40 which then included the main Seto market town and religious centre of Petsery with its spectacular Orthodox Monastery. But in 1944 the Soviets arbitrarily redrew the border so that 4 of the Seto tribal units now lived in Russian territory, with their former town of Petsery (Pechory as it is now known) 3kms across the border, cut off inside Russia. Villages of the so-called Seto Belt now lie along the Estonian side of the Russian border (Click here for map of Seto Villages Belt). 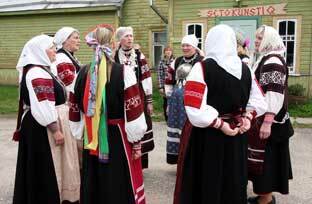 Today the distinctive Seto language and culture are in slow decline: there are around 12,000 Seto speakers in Estonia with only 3,000 of these living in Setomaa, and just 300 still isolated in Russia; this is half the size of the early 20th century Seto population. Despite efforts to promote the language and traditions through organised cultural gatherings, the younger generation is rapidly being assimilated into the main body of Estonian society. 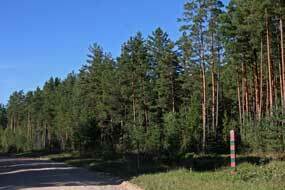 The impenetrable Russian border has split their community since 1991, further hastening the Seto decline. The most distinctive feature of Seto culture is the women's traditional polyphonic choral folk-singing style known as leelo, with partly improvised epic narratives from the lead singer accompanied by a discordant chanted chorus of women singers. 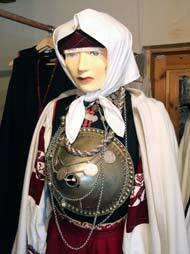 Their traditional folk costumes are also distinctive with dark red as the dominant colour, the women wearing heavy silver jewellery, most noticeably the large silver breastplate-brooch, the Suur Sõlg in Seto (see left). Obinitsa village, Seto culture and leelo singing: passing derelict communist era collective-farm buildings, we drove into Obinitsa village, one of the principal Seto villages and a major Seto cultural centre. On a hillside above the village a statue of the Seto Song-Mother stands, an honorific title for the lead-singer of the Seto leelo traditional choir. By serendipitous good chance, our visit to Obinitsa in 2011 coincided with a gathering of Seto women in their traditional costume and silver jewellery chanting their peculiar polyphony (Photo 35 - Seto leelo chorus); they stood in a circle swaying to the rhythm of their eerie music, the lead-singer reciting a line of verse and the chorus responding with their discordant polyphonic leelo chanting (see above right). 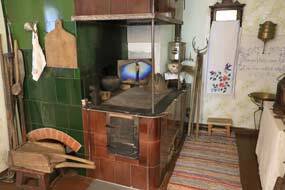 The Seto Museum House set in a traditional timber building aims to illustrate Seto family life in the 1920~40s, with its central porcelain-tiled stove (see left) and displays of national costumes (see right) with the red embroidered scarves and women's handicrafts. In broken English, the lady attendant told us more about leelo singing and the traditions of the Seto silver jewellery: mothers handed on the jewellery as an heirloom when daughters marry and have children, and the large silver breastplate-brooch Suur Sõlg was a sign of relative wealth and standing in the Seto community. An exhibition showed photos and biographies of the Obinitsa leelo choir singers. 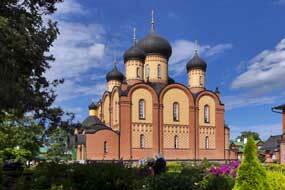 We also learned more about the Setos' religious customs: they had originally adopted Orthodox Christianity when Setomaa had been part of the Principate of Pskov, and the Monastery at Pechory (Petsery) had been their church. But they also retained naturalistic elements of their pre-Christian pagan traditions, particularly those associated with Peko the king-deity of crops and fertility, who according to Seto legend sleeps eternally in a cave at Pechory Monastery; since he cannot rule his people directly, the Peko-Regent is elected annually at the Peko festival in August to represent the Setos in the name of the deity. 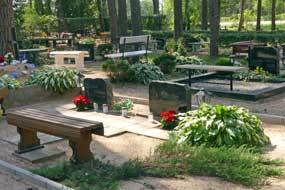 She also described the tragic impact of the division of Setomaa by the Soviet-imposed border, separating families and creating difficulties in tending the graves of deceased family members who were now buried in Russia. Despite her efforts to answer our many questions about Seto culture, her English was too limited; she called a neighbour who spoke more fluent English, and who showed us the small village chapel next to the museum house. Little more than a simple wooden shack, this was called a Tsässon in the Seto language (Photo 36 - Obinitsa Tsässon) (see right), a word we immediately recognised as cognate with the Karelian word for chapel, Tsasouna which we had learned at Hattuvaara in Eastern Finland (the Karelians who had migrated into what is now Eastern Finland were also a Finno-Ugric people like the Setos). 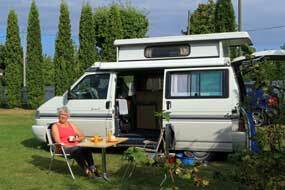 She told us of the traditions of both gathering at the Tsässon and offering simple shelter there for travellers. 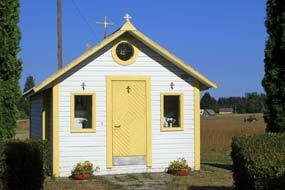 The little chapel was so beautiful in its simplicity, truly a place of peace. There was also the larger Orthodox church in Obinitsa which the villagers had managed to build by their own efforts during 1950, even at the height of the Soviet~Stalinist repression. This had been a fascinating encounter with these 2 ladies who had taught us much about the traditions of the Setos, this curiously enigmatic ethnic minority who with such apparent sang-froid had adapted themselves to the tragic vicissitudes of history. Click here to read more about the Setos. Meremäe Hill Observation Tower and Vastseliina Castle: Obinitsa village was a curious mix of attractive wooden cottages and very impoverished-looking, almost semi-derelict small apartment blocks dating from the Soviet era, along with the decaying remains of communist collective farms. We headed south from the village (click here for detailed map of route) through agricultural countryside; this year's cereal crops looking fully ripe after the recent hot weather were being harvested alongside fields of already harvested stubble. In 7kms we reached Meremäe village and turned south-westwards up onto the rising ground of Meremäe Hill topped by an observation tower. From its viewing platform, views opened up across Setomaa and the distant town of Pechory across the border into Russia where we could just make out through binoculars the glistening domes of the Orthodox Monastery (see above left). Continuing westwards for a further 4kms over the rolling Setomaa hill-land, we reached the conserved remains of Vastseliina Castle. The stronghold was built in 1342 by the Teutonic Knights under the leadership of the Catholic Bishop of Dorpat (Tartu) to subjugate and hold in serfdom the Estonian tribes, and to guard the borderline with Russian territory. 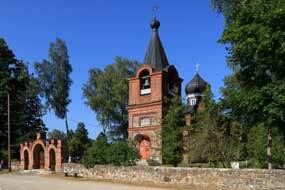 Vastseliina Castle with its chapel and miraculous holy cross became an episcopal centre famed for its indulgences and attracting many pilgrims. It was a mighty and impregnable fortress built on a prominent mound, probably the site of a predecessor Estonian wooden tribal stockade-fort. The castle was developed and enlarged over the 15~16th centuries and constantly fought over by Teutons, Poles, Swedes and Ivan the Terrible's Muscovites, and finally captured by Peter the Great in the early 18th century Great Northern War. 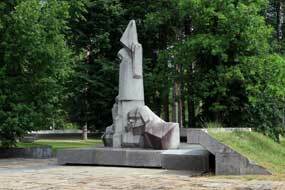 Vastseliina was even the scene of fighting in 1944 as the Red Army drove back the occupying Germans. Part of the enclosing fortress wall, a corner tower and 2 further remains of towers survive, built of local limestone with upper storeys of brickwork with ornate decorative features (see above right). 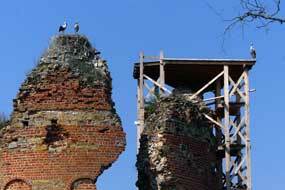 A family of storks nested atop the ruins of a surviving corner tower (Photo 37 - Vastseliina Castle and storks) (see above left). We parked and walked over to the museum, pleased to find a dual-pricing arrangement of €2 to enter the castle grounds and €7 for the tourist-oriented museum. 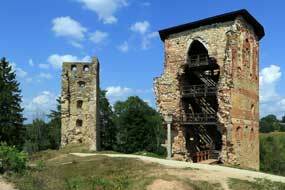 We were more than happy just to explore the castle remains and to climb the surviving towers (see left). It really was a formidable structure: the surviving walls and towers would have enclosed a central area on the castle-mound top where the episcopal chapel and bishop's palace would have been sited (see right) (Photo 38 - Vastseliina Castle towers and palace mound); the inset photo shows a model of the reconstructed original episcopal palace and castle. 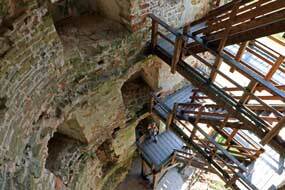 In the museum we tried to ask more on the castle's history, but language limitations prevented our learning more. Closed Russian border at Meremäe: as we returned to Meremäe, it was clear from the map that the onward road through the village led to the Russian border; it was also evident from the No Through Road sign that there was no border crossing here and the lane would end at a sealed border. 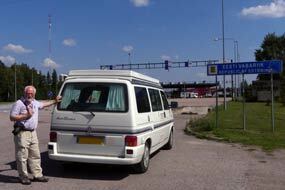 There are now only two visa-controlled border-crossings from Estonian Setomaa into Russia: Koidula on the A63 from Värska and Luhamaa further west on the A7 to Pskov. All the other minor lanes are now totally sealed. Nervously we drove along for 4 kms passing harvesting taking place in Estonian fields, and finally, by an attractive wooden farmstead, the road ended at a barrier with No Entry signs (see right), with the line of border markers visible across the fields. 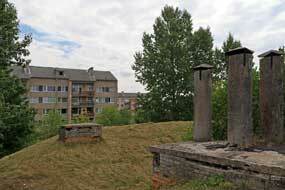 We took our photos and withdrew, back to Meremäe with its usual unattractive Soviet era panelaky apartment blocks. Back up to Obinitsa, at the northern end of the village we found the Seto Orthodox Church now undergoing restoration (see left), and alongside among woodland the village's Seto graveyard; each family grave was decorated with flowers and surrounded by benches (see below right) (Photo 39 - Obinitsa graveyard); as part of their ancestral mixed Orthodox~pagan beliefs, the Seto hold picnics at festival times around the graves and leave food for their deceased. Piusa Sand-Caves: the northward ongoing lane dropped down steeply to cross the Piusa River and the Valga~Pskov railway line, to reach the turning to the Piusa sand-caves. The sandstone deposits of the Piusa valley were mined for quartz sand to support the glass-making industry. Underground mines were excavated by hand, by tunnelling into the sandstone deposits creating a huge maze of 10m high galleries with arched ceilings supported by substantial sandstone pillars bearing the weight of the roof. The caverns were worked from 1922 until 1966 when mechanically operated open-cast quarrying for sand took over just to the north. 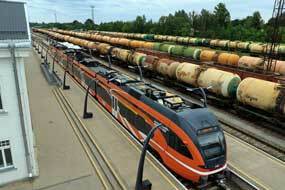 The excavated sand was transported to the nearby railway line for onward shipment to glassworks elsewhere in Estonia. The abandoned sand caverns with their constant temperature and humidity became the perfect hibernating site for bats, and are now occupied by overwintering colonies of some 3,000 bats of 5 different species from all around the Baltics. Until 2008, there was open access to the caverns for visitors to scramble inside. Under pretext of safety however, the caves have now been touristified with an over-priced visitor-centre, video showings about the hibernating bats, and brief guided visits to the sand caverns. 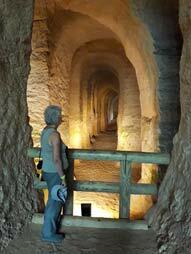 We were fortunate to find an English-speaking guide who gave us a historical overview and brief visit to the cathedral-like galleries (see left) (Photo 40 - Piusa Sand-Caves). We also took the opportunity to ask about cross-border traffic for locals, visa-access to Russia and cost. Until recently there was limited availability of free-issue of year-long visas (with much bureaucratic form-filling and long delays) for locals. Gradually however access to such free-issue visas had been withdrawn and the 12 month visas now cost €150 again with much form-filling and delays. We also talked about the brisk cross-border trade in cheap cigarettes, alcohol and petrol in Russia, and regular trips into Latvia via the open Schengen border for cheaper fuel, as we had found at Valga~Valka. Although it was by now 5-30pm, before leaving Piusa we did want to re-walk the 1.5km nature trail around the pine-forests between the sand-caves and the modern quarries. 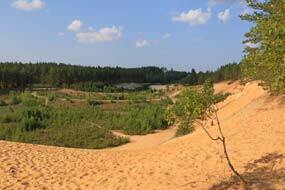 Up over wooden step-ways past partly excavated sandstone outcrops and collapsed earlier workings, we approached the edge of the open-cast area of modern sand quarrying, a vast sea of ochre-coloured sand surrounded by pine forests (see right). We picked up the route of the nature trail, following this around the rim of the quarry and into the heath-land forest. It was here in 2011 that we had first encountered Lingonberries, so for us this place had special connotations. 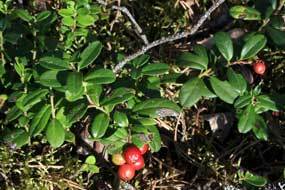 Among the classic sandy heath-land forest floor of Ling and Bilberry, we soon found plants of of leathery leafed Lingonberry with ripening fruit (Photo 41 - Lingonberry) (see below left). We followed the trail around through the forest past collapsed underground sand workings and WW2 German trench-lines, back to the parking area. Hirvemäe Holiday Centre/Camping at Värska: we now had a 25kms drive on rural back-lanes, passing through the villages of Orava and Treski, where a small Seto Tsässon stood by the roadside (see below right) and harvesters were busily at work in the fields. This brought us to the large village of Värska, tucked away in this far isolated SE corner of modern-day Estonia on the shores of Lake Pihka, the southern extension of Lake Peipsi. Reaching Värska, we found the A-ja-O mini-market for provisions and were pleasantly surprised by a young assistant, Karina, who chatted away in fluent English, having lived in Holland for 2 years. 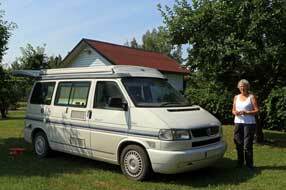 In the village outskirts, we turned off to Hirvemäe Holiday Centre/Camping where we had camped in 2011. The lad in the kitchen did his best to help us, showing us the limited and unshaded camping area and rather unclean facilities. We scouted around and found a more shaded place to camp among the pine trees on a flat-topped hillock, just about accessible and overlooking the lake. 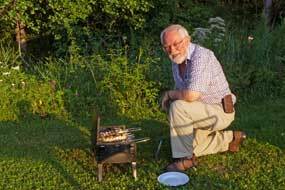 We brought George up onto the hillock and settled in for a late supper in the early evening sunshine (see below left) (Photo 42 - Hirvemäe Camping). 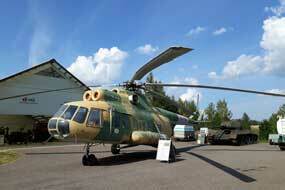 What a day of exploration and learning this had been, along the Setomaa border with Russia. Värska's first class Tourist Information Centre: we packed and managed to extricate George from the hillock at Hirvemäe Camping to drive back into Värska which gave the appearance of being as anachronistic as it was remote, simply a scattering of communist era low apartment blocks among the pine trees (click here for detailed map of route). First stop was the TIC where we were greeted by a fluently English-speaking lady named Elin, who answered all our questions, overwhelming us with detailed information not only about Setomaa and the Seto traditional way of life, but also about other areas of Estonia to visit. 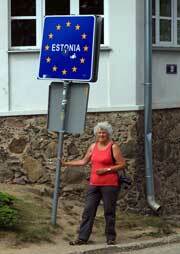 Elin's family was Seto in origin but had moved to Tallin 3 generations ago. She had now moved back to Setomaa and although she could read Seto, she admitted to being unable to speak the language. She was however able to answer more of our questions adding further to our understanding of Seto history and culture. 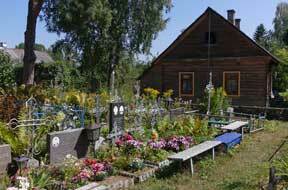 Many Setos had left Setomaa for the cities, particularly during the Soviet period when being identified as Seto was stigmatised. 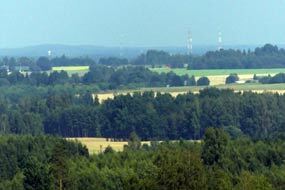 The Estonian authorities now offered incentives to encourage the young to return to Setomaa, resulting in shortage of housing in the region such as at Värska. We had been intrigued by the curious mix of attractive rural wooden cottages alongside semi-derelict panelaky apartment blocks in villages such as Obinitsa and Meremäe. Elin confirmed our supposition that the apartments had been built originally during the communist period for workers on collective farms, adding that they had also been assigned as housing for public service workers such as teachers or kindergarten staff. She also described the chaotic situation after Estonian independence in 1991: apartments had been forcibly taken over by the communist state in 1950s, and in 1991 attempts were made to return them to their original owners. Occasionally this meant that people who could not prove ownership had to leave homes they had occupied for 40 years. Ownership of remaining apartments now rests with local authorities. She told us more about the traditional Seto festivals: the graveyard picnic days varied between villages, but the Seto Kingdom Day (Seto Kuningriik), when the Setos gather to elect the Peko Regent to represent them, happens on the first Saturday in August; this year's Kingdom Day Festival would be held this coming Saturday at Lüübnitsa, and she urged us to attend. We talked more about the difficulties created by the imposed border which now divides Setomaa, and the necessity of obtaining visas even to visit the graves of family members. 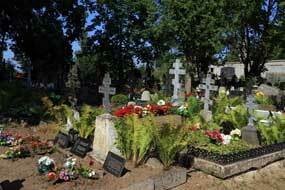 The border treaty allowed for an annual allocation of 2,000 free of charge 'cultural visas' to attend festivals or for graveyard visits: the Russian authorities had however recently privatised administration of visas issues, and the contract for providing the service awarded to a Chinese contractor with no local knowledge or awareness; claims of abuse of the free issue visas for shopping purposes had led to increased bureaucratic demands for justification of festivals attended. 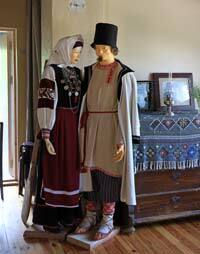 We spent over an hour talking with Elin about the Seto people and their traditions. Saatse Boot salient of Russian territory projecting into SE Estonia: our final questions to Elin were about the curious geopolitical border anomaly of the so-called Saatse Boot, a boot-shaped 115 hectares salient of Russian territory projecting into SE Estonia through which a public road passes en route to Saatse village in the far remote, isolated corner of Estonia (Click here for map of Saatse Boot). Elin reassured us that there were no border control formalities and that it was both legal and safe to drive through without visas provided we did not stop or attempt to pass through on foot. The origins of this border line anomaly date back to the 1945 re-drawing of borders between Russia and the then Estonian Soviet Republic: the piece of land in question almost 1km wide had historically belonged to one farm at Gorodišče 2kms further east into Russian territory, and the border line was drawn around the outline of the farm, which has long been abandoned. 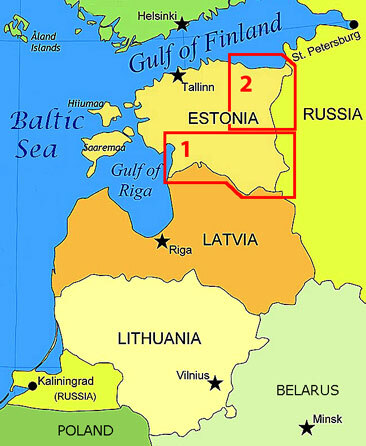 Before Estonia regained independence, the line was simply an administrative division between 2 constituent republics of USSR, but since 1991 the line now forms the international border between Estonia and Russia, referred to officially by Estonia as the Line of Control. 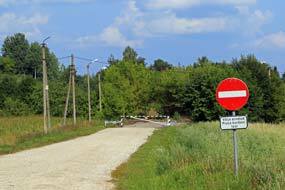 In 2005, a new border treaty was agreed at diplomatic level under which the anomaly of the Saatse Boot would be rectified and the land transferred from Russia to Estonia in exchange for a land-swap elsewhere. This has still to be ratified by the Russian government, and in the meantime therefore, this anomalous protrusion of Russia remains to be driven through without visas, a novelty for tourists but constant hassle for locals driving from Värska to the outlying villages; even the daily bus to and from Saatse must make the passage through the Saatse Boot. Today we should brave the way through the Saatse Boot; and ironically today was also the day after the funeral of Dawn Sturgess, the innocent British victim killed near Salisbury by contamination from the abandoned perfume bottle of Novichok, the deadly nerve agent used by agents of the Russian GDR in the attempted assassination of the Skripals earlier in 2018. Given worsening West~East relations and Russian border sensitivities, we were both intrigued but doubly nervous this year about driving through the Saatse Boot. Just beyond Värska, the Seto Farm Museum, housed in original reed-thatched wooden buildings, recreates a typical Setu farmstead of the early 20th century, and the neighbouring Seto Tsaimaja farm restaurant serves delicious smoked pork dishes; we had visited these in 2011, and today with nervous hesitation we ventured ahead. Beyond the Värska mineral water plant, the lane became gravel-surface on entering the forest (Click here for map of Saatse Boot). Elin had even advised us to switch off our phone data roaming to avoid inadvertently logging onto a Russian network and incurring undue costs! 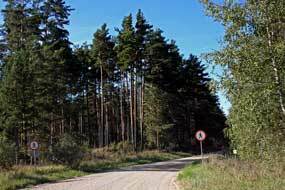 Just beyond the Estonian hamlet of Lutepää, we reached the first set of yellow border warning signs and No pedestrians signs as the lane ran for some 500m alongside the Russian border with its maroon and green Russian frontier-posts and line of barbed-wire fencing edging the forests. Then came the second set of warning signs and border-markers as we began the 900m long Saatse Boot passage through Russian territory (see above left) (Photo 43 - Saatse Boot). We kept up a steady 30kph, but despite our tenseness, passed through without hindrance or any awareness of Russian border guard presence. It was with much relief that we passed similar signs indicating we had safely reached Estonian territory again at the far end. 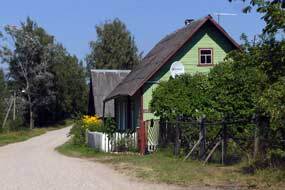 There had been little to see, no border patrols, no armed guards, nothing but forest, and the dirt road led on to the further Estonian hamlet of Sesniki, swinging NE-wards to reach the larger and scattered settlement of Saatse, totally isolated in this furthest SE corner of Estonia. Saatse village and Orthodox Church: reaching the scattered settlement of Saatse, we turned off in the village outskirts to visit the Orthodox church (see above right). The Saatse Orthodox Church was built of stone in 1801 to replace an earlier wooden church, and was dedicated to St Paraskeva, a Greek Orthodox Christian Martyr, the name meaning Friday the day of the saint's baptism and of Christ's crucifixion. It had historically served a large mixed Russian and Seto congregation from around Saatse, a parish which in 1880 had over 2,000 residents. 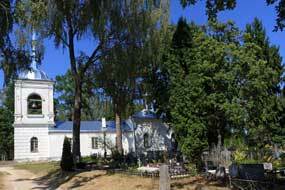 The patronal day of St Paraskeva on the last Friday of July is now celebrated as the main local Seto feast day, one of the largest in Setomaa, with an icon carrying procession around the church followed by graveside feasting to commemorate deceased ancestors (Photo 44 - Saatse Orthodox Church) (see above left). 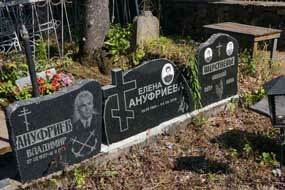 The Saatse graveyard had small benches around the graves (see above right), many of the headstones having names in Cyrillic (see left). Alongside the Orthodox Church was what seemed an older but semi-derelict red brick structure with an east-end apse, suggesting it was also a church building (see below right). 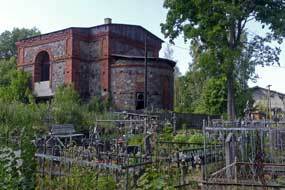 An elderly gent who was sat in the shade by the graveyard tried to respond to our evident curiosity about the building, seeming to say vana kirik, which we took as Estonian or Seto for Old Church. We later learned that this church had been built for Orthodox Old Believers living in Setomaa, but funding had run out; the building was left incomplete and now falling into ruins. Saatse Seto Museum, and border-crossing into Russia: continuing along past the village's scattered wooden cottages (see below left), we reached the Saatse Seto Museum which was set in the old school house and founded by a former school master. Although there were many displays of traditional costumes, jewellery, household items and wooden farming tools, the detailed commentaries were only in Seto or Estonian and the attendant spoke no English. There was a wealth of recordings and videos of leelo singing and Seto gatherings, but we could gain little understanding, a real disappointment. Outside in the gardens was a mock up of the border posts which now divided Setomaa (see below left). Uncertainly we continued beyond the village heading along the trackway which we assumed would end at another sealed border. To our surprise however we reached a small border crossing-point which we later learned was pedestrians only (no vehicles) and only open during daylight hours (Photo 45 - Saatse border-crossing). Quite surrealistically Russian pedestrians dragging suitcases were walking through on the rough track leading into Estonia and the EU! We took hasty photos and withdrew back to the village. 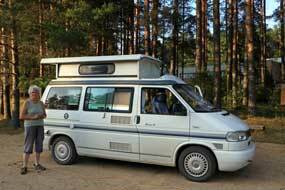 We now had the drive back through the Saatse Boot to return into the main body of Estonian territory. On our return journey in 2011, hidden Russian observers had taken close interest in our passage! This time however none were evident, and we passed through without incident seeing only an Estonian border-police van parked by the forest. Podmotsa on shore of Lake Pihkva and Russian border: it was 4-00pm by the time we were back into Värska, and still very hot. We continued out to the tiny hamlet of Podmotsa set on a peninsula by the water's edge of an inlet from Lake Pihkva (click here for detailed map of route). This entailed a 6kms drive along the dustiest of gravel lanes with dense clouds of fine dust billowing up behind George and penetrating every crevice of his inside. The reed-lined lake shore at Podmotsa looked across the narrow stretch of water forming the border-line to the village of Kulje on the Russian side with its domed Orthodox church and the inevitable Russian guard-tower (see right) (Photo 46 - Russian border at Lake Pihkva). Russian border-crossing at Koidula: back past Värska Orthodox Church (see below right), we set course for the 20kms drive on Route 63 to the main visa-controlled border-crossing into Russia at Koidula. At Matsuri the road curved steeply downhill to a large lorry parking area just before the border zone. We managed to park at an almost full car park on the opposite side of the road (why all these cars were parked here out in the wild by the border zone remained an unanswered question! ), and walked on for 500m under the Valga~Pskov railway line by the freight terminal towards the border post (see below left) (Photo 47 - Koidula border crossing into Russia). When we were last here at Koidula in 2011, there had been lengthy queues of trucks waiting to cross through the border-control; this year was more quiet, with just the occasional car passing through. We later learned that much freight still is transported into Russia at Koidula, both by lorry and via the rail link, and that Western sanctions against Russia have had little impact on border trade. North to Lake Peipsi: our brief time in Setomaa and the interesting people we had met had given us unique opportunity to learn so much about Seto culture, traditions and history, and about the tragedy of the divided border and difficulties with visas and border crossings; without doubt this had been one of the trip's most memorable highlights. After a final night's camp back at Hirvemäe, we dropped the keys off with the campsite owner (who in his broken English wished us 'good driving'), and turned northwards for the next phase of our trip up to Lake Peipsi and the lands of the Russian Orthodox Old Believers (click here for detailed map of route). Route 45 from Värska was bedevilled by road works with lengthy sections of unsurfaced road and temporary traffic lights slowing progress. With regret at missing Saturday's Peko Regent Seto Kingdom Day Festival (see poster below left), we passed the turning for Lüübnitsa to reach Räpina to shop for provisions at the Maxima supermarket. Just opposite, the young girl at the Tourist Centre did her town credit in answering more of our questions about the region, despite her limited English and Räpina being at the northern edge of Setomaa. NW-wards from Räpina, we headed towards Tartu passing Mooste on Route 45 across well-cultivated agricultural countryside, with crops ripe and harvesting taking place. 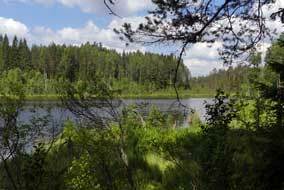 Beyond Tartu, we crossed the broad and sluggishly flowing Emajõgi River on its lower course into Lake Peipsi, and turned off onto Route 44 and again onto Route 43 out Koosa and on to Alatskivi and Kallaste. There were frequent quarry trucks on these roads, indicating that alluvial sand and gravel was being quarried from the land around Lake Peipsi. 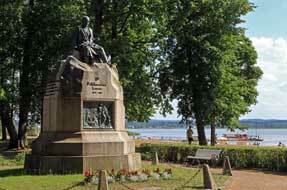 Lake Peipsi and the Russian Orthodox Old Believers: Lake Peipsi is Europe's 5th largest lake after Lakes Ladoga and Onega north of St Petersburg in Russia, Lake Vänern in Sweden and Lake Saimaa in Finland. It is a remnant of a larger body of water which existed during the Ice Age, and today covers an area of 3,555 square kms spanning the borders of modern Estonia and Western Russia, with an average depth of just 7.1m. Looking out from its sandy shore, it gives the appearance of the sea rather than an inland body of water. The western shoreline of Lake Peipsi was settled in the early 18th century by members of the Russian Orthodox sect of Old Believers who came here from Western Russia as refugees to escape religious persecution. They rented land along the lake shore to found their villages, build their churches and practice their traditional style of the Orthodox faith; here they settled to fish and to grow onions much as their descendents do today in these isolated villages. The origins of the Old Believers (Vanausuliste in Estonian) go back to the liturgical reforms introduced into the 17th century Russian Church by Nikon, Patriarch of Moscow. Faced with a schismatic diversity of liturgical rituals, Nikon set about systematising Russian Orthodoxy. The disputed variance of rites seems today almost trivial: the use of 3 fingers rather than 2 in making the sign of the cross, the manner of bowing, and the style of ecclesiastical dress. Nikon however enforced his reforms and dissenting priests were removed from office. 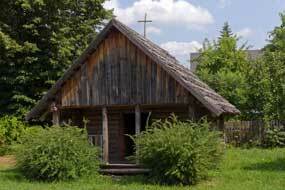 But despite persecution, imprisonment and torture, many of the congregations persisted in the old ways and became branded as Old Believers by the church hierarchy who wished them marginalised. Peter the Great backed enforcement of the reforms and during his reign as Tsar, groups of Old Believers packed their bags and migrated west to settle on the remote shore of Lake Peipsi in the hope of escaping persecution and being left to practice their religion as they wished. Rejecting the ecclesiastical hierarchy of conventional Orthodoxy, they chose their clergy from among the local community rather than the priesthood, and services were conducted in Old Church Slavonic, the medieval language of Cyril and Methodius. Strict adherence to traditional belief prevented their assimilation with post-WW2 Russian immigrants and although numbers declined during the communist period, the religion enjoyed a revival after 1991 Estonian independence, and there are still some 15,000 practising Old Believers. The woebegone town of Kallaste: reaching Kallaste, we turned off into the town whose population is still predominantly Russian from its 18th century foundation by Russian Old Believers émigrés as a fishing port on the western shores of Lake Peipsi. 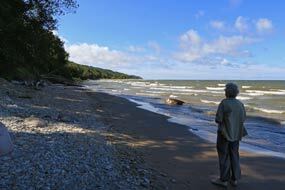 Hopes that the lakeside beaches might attract holiday-makers from Russia seem to have come to nothing, and the lake fishing industry has also declined. We eventually found the Tourist Centre in the town hall, a rather over-grand building with its classical pillars for such a sadly woebegone looking place. And matching this passé air, the TIC was equally woebegone and staffed by a poor, inadequate youngster: we never did discover what languages she spoke, since try as we would, her only form of communication was limited to a sadly pathetic whimpering! There were virtually no information leaflets, and the only town plans were semi-legible photocopies of a Google Maps print! Poor Kallaste's Tourist Centre must go on record as the saddest, most inadequate of the trip; but then it matched its town as the most woebegone place we had visited this year, such a sorry, sadly run down place. We did eventually find the A-ja-O mini-market, managing to buy basic foodstuffs, before driving around to explore further this lost world forlorn backwater of a place called Kallaste. The grandiose 1950s public buildings looked incongruously out of place and run down, and the apartment blocks seemed semi-derelict but still occupied: the lines of washing on their balconies seemed to emphasise the sadly squalid atmosphere of the place. To the north of the town, around by the industrial quarter of the former lake-fishing harbour, nothing remained but dereliction and squalor. 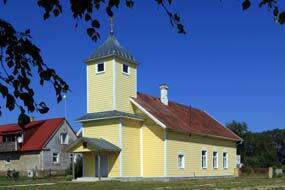 Of all the places we had visited in Estonia, Kallaste was the most desperately impoverished. 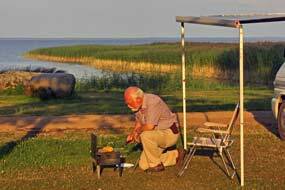 Hansu Turismitalu-Camping at Kodavere, Lake Peipsi: we had happy memories of our camp by the reed-lined shore of Lake Peipsi at Willipu Guest-house/Camping in 2011 and turned down Route 43 to the gravel driveway leading out to Willipu. 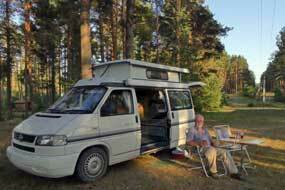 In today's torrid heat however the open camping area, devoid of any shade would be intolerably hot. We looked around, but with no trees for shade, we had with regrets to leave Willipu in this year's exceptional heat-wave weather, and investigate our fall-back alternative, Hansu Turismitalu-Camping at Kodavere village. Just north of Kallaste, we turned off Route 43 and found the place; the elderly owner spoke no English but we conversed readily in German. The large garden camping area to the rear of the guest-house also had little shade, but we managed to tuck George in under apple trees, giving at least some afternoon protection from the sun for our planned day in camp tomorrow (see above right and left). The hospitable owner cleared away fallen apples which were attracting wasps, helped us to position George to maximise the little shade, and found us power. The basement facilities were straightforward but functional, the price was €15/night, and we settled into this pleasant spot in the garden orchard. As the later evening grew dusky, temperatures became acceptably cooler. 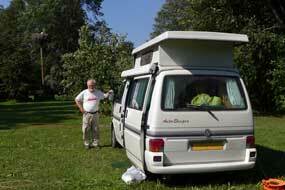 The following day we breakfasted outside under the shade of the apple trees as the sun heated the camper's roof. Later in the morning, dark clouds began to gather with distant thunder rumbling around and a stormy wind whipping up tree seeds. We just managed to get sleeping bags stowed from an airing on the clothes line before the storm broke with a downpour. The storm passed and sky cleared, leaving the air cooler for us to continue with a day's work with more comfortable temperatures. We survived another hot day tucked into the shade of Hansu's garden apple trees. Lake Peipsi Old Believers' villages and Kolkja Fish and Onion Restaurant: another hot day, with the apple trees giving minimal shade as the sun rose above them. Today we planned explore the series of single-street Old Believers' villages which extend linearly along the shore-line of Lake Peipsi, Kolkja, Kasepää and Varnja, each with its Old Believers' church and graveyard (click here for detailed map of route). All the wooden cottages have a boat-mooring for lake fishing and a large vegetable garden where onions traditionally are grown (see above right). Back down the main Route 43 to Alatskivi, we turned off onto the minor road out to Kolkja village which is home to the Kolkja Fish and Onion Restaurant (Kolkja Kala-Sibula Restoran), serving traditional lunches of Lake Peipsi fish and locally grown sweet onions; we planned to treat ourselves to lunch here. Inside nothing of the formal atmosphere had changed since our last visit in 2011: the old wooden furniture, the menus, the Russian-speaking young waitresses, and the samovars on the tables. We each ordered the fish soup followed by stewed pike-perch with onions and potatoes (Photo 48 - Fish and Onion Lunch) (see above left), and we followed our meal with tea served from the samovar (see above right). 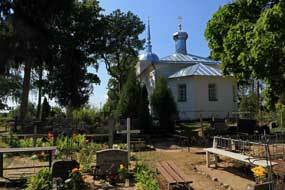 Old Believers' Museum and Kolkja Church: after lunch we walked along through the village in the bright sunshine, past stalls selling locally grown onions and wooden cottages with flower gardens and small-holdings of onion beds. A crowded storks' nest on a power pole held 4 fully-grown young birds still not flying and waiting impatiently to be fed by the parent birds (Photo 49 - Crowded storks' nest); they stood side by side at the edge of the nest, almost mewing in the heat of the afternoon sun. So crowded was the nest by this stage of the year that no room was left for the adult birds who stood in seeming exasperation on the roof of a nearby barn between foraging trips (see right). 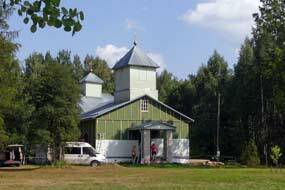 We walked around to the Old Believers' Museum; housed in the former village school at Kolkja, the museum presents details of the history and practices of this traditional branch of Orthodoxy. We had earlier arranged through Tartu TIC to visit the Museum this afternoon, and we were greeted by a very dour-looking Russian lady with the only English words she knew 'Six Euros please' as she opened up for us! 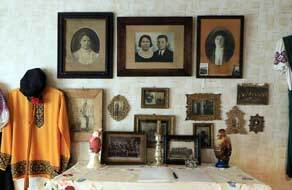 The Old School House was filled with displays of household articles, photographs of Old Believers' families, traditional costumes (see above left), with a central ceramic stove for heating (see above right), and an icon prayer corner in each room (Photo 50 - Icons prayer corner). 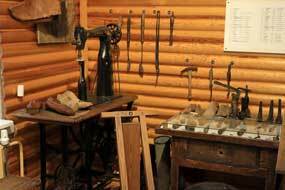 One room was filled with tools, including a boot-making Singer sewing machine. Posters in English gave the history of schisms and persecutions which brought the Old Believer émigrés to Lake Peipsi on the remote western edges of the Tsarist Empire. 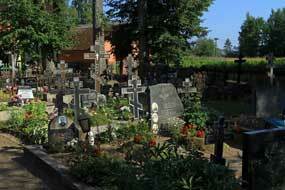 Just around the corner, we found Kolkja's Old Believers' wooden church (see above left), its graveyard a forest of three-barred Orthodox grave crosses (see left) (Photo 51 - Orthodox three-barred crosses) and headstones inscribed with Cyrillic script. We had chosen a good time of year to visit the Old Believers' villages since this year's crop of onions had just been lifted and the onions were drying in racks and sheds along the village street; we stopped at one of the cottages to buy a string of Old Believers' onions from a buxom Russian lady whose modesty was scarcely concealed by a minimalist bikini! 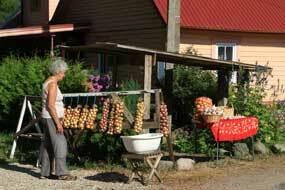 (Photo 52 - Buying Old Believers' onions) (see right). We also investigated a small campsite signed along a side lane from the main street; it was a delightfully peaceful garden setting, but such a pity lacking any shade from the unrelenting heat of the sun. Kasepää and Varnja Old Believers' villages: back through the village, we drove along the lake-shore lane, where many of the cottages had strings of onions hanging outside for sale. 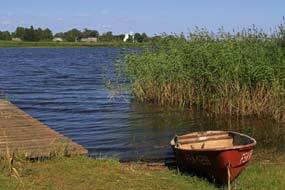 From the lane, creeks led down to the lake with boat anchorages, the easterly breeze driving waves onto the sandy lake shore between the reed-beds. At the next village of Kasepää, there were more onion stalls (see left) and onion drying racks alongside many of the cottages (Photo 53 - Onion drying racks) (see below right). We eventually found the Old Believers' church (Vanausuliste kirik) at the far end of the narrow and winding Kiriku Street; this was locked but we walked around the shady graveyard examining the Russian Orthodox crosses (Photo 54 - Russian Orthodox crosses) (see below left), the lower slanting cross-bar said to represent the path from earth to heaven. The lake-side lane led to the southernmost of the Old Believers' villages, Varnja, but the church now seemed abandoned and forlorn. 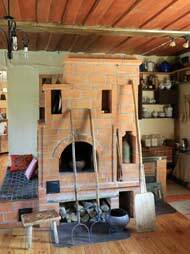 We returned north, pausing at Kasepää to buy another bag of the small, sweet onions and to photograph the onion drying racks, and at Kolkja to look at the small Old Believers' prayer house. 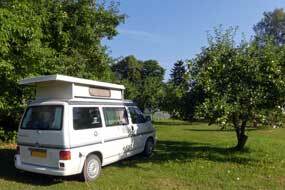 Having found no alternative campsite with shade, we returned to Kodavere for a final night at Hansu Turismitalu-Camping, settling back into the shade of the orchard apple trees. Raja, Mustvee, and Lake Peipsi smoked fish stalls: a hazy sun the following morning suggested another hot day for our northward drive eventually to reach the Baltic Coast of NE Estonia (click here for detailed map of route). Just north of Kodavere, we passed a pleasant looking small campsite with trees for shade and overlooking the shore of Lake Peipsi. This looked to be worth investigating if ever we passed this way again. 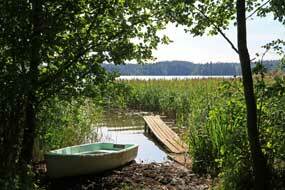 Turning off around the shore-side lane through Kasepää brought us to the single street lakeside village of Raja. Among the cottages, we found the surviving bell-tower of Raja Old Believers' church which had been destroyed in the fierce 1944 fighting (see right) (Photo 55 - Raja church bell-tower). Services are now held in the neighbouring Icon Painting School which was founded in 1880 and has continued its work through all the changes of regime in both Tallinn and Moscow. Despite the gates being locked, we managed to get our photos of the bell-tower from the fence along an alleyway leading down to the lake shore. On to the larger port-village of Mustvee, with its 4 Lutheran, Baptist, Orthodox and Old Believers denominational churches, we paused to photograph the Orthodox church (see below left) (Photo 57 - Mustvee Orthodox Church) before re-joining the main Route 3. The main road ran around the northern shoreline of Lake Peipsi, although the lakeside fringe of pine woodland prevented further views of the lake. But stalls selling smoked Lake Peipsi fish (suitsa kala) lined the roadsides, and we bought a brace of perch and a whole bag full of smaller smoked fish for suppers to accompany our Old Believers' onions. Iisaku Village Museum: Route 3 turned inland at Kauksi leading to the village of Iisaku, where the Iisaku Village Museum (text still unfortunately only in Estonian) presents an admirably commendable exhibition on rural life in Ida-Virumaa County of NE Estonia during the 19~20th centuries. The free-entry museum was founded in 1975 by school teachers in the former village school, with many of the exhibits contributed by the school children. The lady attendant seemed pleasantly surprised to have visitors from England, and switched on the English language computer screen commentaries for us describing the various rooms' displays: the history and culture of the Poluvernik (Half-believers), Russian émigrés to the region who adopted a combination of both the Lutheran and Orthodox faiths and who spoke a mixed language of Estonian and Russian; archaeological finds of the Votian peoples, a Finno-Ugric tribe related to but distinct from Estonians, Finns and Karelians, now almost extinct, who had occupied Ingria, the area of NW Russia around modern St Petersburg; an impressive collection of tools and equipments illustrating villages crafts and trades, such as weaving, shoe-making (including another Singer boot stitching machine - see right - particularly interesting given our family history in the show-making industry), carpentry, tailoring, and black-smithing; a school room showed school life during the first period of Estonian independence and the Soviet period including school photos (see below left), with particular reference to schoolmaster Robert Theodore Hansen who set to music one of Lydia Koidula's poems, A Mother's Heart; another room illustrated the work and importance given wooden houses of the voluntary fire service during the 20th century; an admirably presented nature room displayed the flora, fauna and birdlife of the region. This unpretentious but excellent village museum is well worth a visit; its first class presentations outclass many of the museums of Tallinn and Tartu. Pühtitsa Orthodox Convent: the sky was now filled with ominous looking thunder clouds threatening a storm as, just north of Iisaku, we turned off onto a minor road through the forests, gaining height to reach the village of Kuremäe which was dominated by the domes of the Cathedral Church of the Pühtitsa Orthodox Convent (Photo 57 - Pühtitsa Orthodox Convent) (see right). The name Pühtitsa in Estonian means Holy place, from the legendary divine apparition witnessed by a local shepherd in the 16th century; an icon was discovered nearby which now stands in the Dormition of Mary Cathedral at the Convent. Founded in 1891 the convent is now home to a community of 150 Russian Orthodox nuns who work the surrounding land and lead a self-sufficient and secluded life here. We parked just outside the gates and walked up through the gatehouse archway whose ornate mosaics displayed the convent's patron saint, Mary Mother of God (see below left). While the sun was still shining, we continued past the cathedral-church with its onion domes through to the formally laid out gardens, where nuns went about their work tending the flower beds. 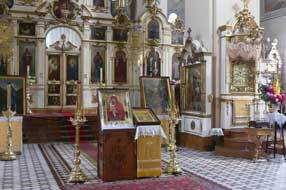 The Cathedral was filled with silver-mounted icons (Photo 58 - Cathedral Iconostasis) (see below right) with prominence of place given to the church's treasure, the revered image of the Dormition of Mary recalling the convent's miraculous origins. The most unlikely of visitors crossed themselves with Orthodox fervency or kissed the icons, as we stood quietly in one corner. A number of other churches stand within the hilltop convent grounds, including the Refectory Church of St Simeon the Receiver of God and St Anna the Prophetess; with protective patron-saints like that, the nuns must enjoy particularly special meals in such a canteen. In the souvenir shop, an elderly nun sold icons and empty plastic bottles for visitors to fill with holy water from the convent's mystical spring which allegedly never freezes. 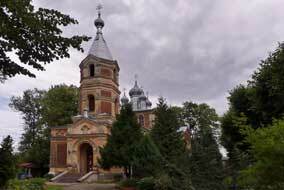 We contented ourselves with a stroll around the grounds and a sip of water from the holy fountain. Jõhvi, a Soviet era town of NE Estonia's industrial belt: we now needed to turn our attention to more mundane matters, and headed north to Jõhvi to find a supermarket for provisions for the weekend, to accompany our Lake Peipsi smoked fish bought earlier near Mustvee. Driving into Jõhvi, passing a large army camp where bored-looking squaddies sat around by the gates, we found our way into the town centre, and parked by the grandiose Stalinist architectural style town hall to shop at the Rimi supermarket. Jõhvi is a typical Soviet era town of NE Estonia's industrial belt, the capital of Ida-Virumaa County, which developed around the oil-shale industry. 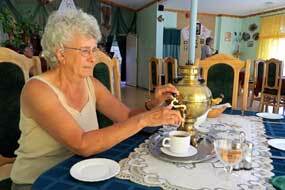 Two thirds of the 16,000 population are Russian and only one third native Estonians. Toila Spa Camping overlooking the Baltic coast: having completed our shopping, there was little else to detain us at Jõhvi and we joined the main Route 1 eastwards for a couple of kms before turning off to the Baltic coast to find tonight's campsite Toila Camping by the Spa Hotel. 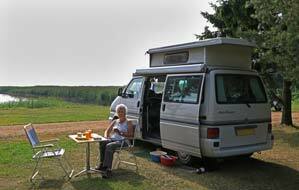 When we had last stayed here in September 2011, we had the place to ourselves; today being a summer weekend, the campsite was quite busy, with all the spaces under the shade of the cliff-top pines already occupied. The forecast however for tomorrow's planned day in camp was for less hot weather with cloud and storms. We found the best spot available, booked in at €20/night, and settled in to cook tonight's supper, a regional success: Peipsi smoked fish with roast potatoes from Jõhvi's Rimi and Kolkja Old Believers' onions simmered until soft. After a night of more comfortable temperatures, the following morning was bright with a cooling breeze blowing off the Baltic, and before beginning our day's work, we walked down the steps which descended the 50m high klint cliffs to the narrow Baltic wild beach below the campsite (see left) (Photo 59 - Baltic beach). After such a fulfilling 3 weeks spent exploring inland Estonia, we were again camped within sight and hearing of the Baltic surf (see right) (Photo 60 - Toila Spa Camping). We shall now explore the NE Estonian industrial towns and the oil-shale industry which had caused such pollution during the Soviet era and which still forms the country's foremost natural resource, burned directly as a low-grade fuel in power generation or the shale-oil extracted for refining. We shall reach the easternmost point of our Baltic Circumnavigation at the Russian border at Narva, before beginning our long journey home, initially in the North Estonian Lahemaa National Park, then across to the Western Islands of Saaremaa and Hiiumaa, before visiting Estonia's capital city, Tallinn. 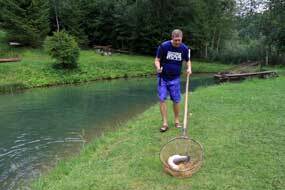 But that's all for the next episode from Estonia which will follow shortly.